This is a timeline of the War in Donbass, for October 2018. The timeline follows an ongoing conflict between Ukraine and anti-government pro-Russian separatists supported by Russia in the Donbass region in eastern Ukraine. According to the information provided by the spokesman of the Ukrainian operational headquarters in the morning, pro-Russian troops had opened fire on 28 occasions on Ukrainian positions the previous day (including on 12 occasions in Donetsk and on 16 occasions in Luhansk region); the fire was returned on several occasions. By morning of 1 October three ceasefire violations were registered with no casualties on the Ukrainian side. The spokesman of the Ministry of Defence confirmed at noon that one Ukrainian serviceman was wounded in action in the Donbass region on the last day of September. Pro-Russian authorities at Donetsk city reported 20 Ukrainian violations of the ceasefire in 14 locations using small arms, heavy machine guns, snipers, automatic grenade launchers, 73 mm antitank recoilless rifles, 120 mm mortars, antiaircraft guns, armoured personnel carriers and armoured fighting vehicles. According to local sources, the Ukrainian military broke the ceasefire four times within the borders of the self-styled Luhansk People's Republic. The Ukrainian military employed small arms, heavy machine guns, automatic grenade launchers, antitank rocket launchers, 73 mm antitank recoilless rifles, 82 mm mortars, 120 mm mortars and BMP-1 armoured vehicles to engage pro-Russian positions at Lozove, Sokilnyky, Zholobok, Kalynove and Kalynivka. The press-centre of the Joint Forces Operation (JFO) reported in the evening that from 7:00 am to 6:00 pm pro-Russian military had opened fire on positions of Ukrainian troops on 5 occasions. By the end of the day total 21 ceasefire violations were registered with no casualties on the Ukrainian side. In the surroundings of Donetsk city and Mariupol, pro-Russian forces shelled Vodiane with rocket launchers, 82 mm mortars, 120 mm mortars and 122 mm self-propelled artillery. Infantry weapons and grenade launchers were fired at Novotroitske, Vodiane, Novomykhailivka, Pisky, Hnutove, Starohnativka, Shyrokyne, Krasnohorivka and Lebedinske. In the northern sector of the demarcation line, Luhanske became the target of 82 mm mortars, while Ukrainian troops at Krymske, Novozvanivka, Zaitseve, Luhanske and Zolote were harassed with small arms fire, heavy machine gun fire and rocket propelled grenades. Pro-Russian officials at Donetsk city told the press that Ukrainian forces had broken the ceasefire on several occasions by evening. Zhabicheve, Kruta Balka, Yasynuvata, Volvo Center, Oleksandrivka, Kreminets and Spartak, in the ouskirts of Donetsk city, Zaitseve and Holmivsky, in the area of Horlivka, and, in the region of Mariupol, Sakhanka, Uzhivka, Pikuzy and Nova Tavrya, came under hostile fire. In the main incidents, Kreminets was struck by 120 mm and 82 mm mortar barrages; 120 mm mortar volleys also landed in Uzhivka, Pikuzy and Nova Tavrya. BMP-2 armoured vehicles from Pisky engaged pro-Russian positions at Volvo Center. Ground forces from the self-proclaimed Luhansk People's Republic shot down a Phantom-4 drone over Nyzhne Lozove. The unmanned aircraft was about to drop a hand grenade on pro-Russian entrenchments. The spokesman of the Ukrainian operational headquarters reported in the morning, that pro-Russian troops had opened fire on 21 occasions on Ukrainian positions the previous day (including on 15 occasions in Donetsk region and on 6 occasions in Luhansk region); the fire was returned on several occasions. By morning of 2 October (as of 12:00 am) six ceasefire violations were registered with no casualties on the Ukrainian side. The spokesman of the Ministry of Defence reported at noon no casualties in the Donbass region on the first day of October. Pro-Russian authorities at Donetsk city reported 20 Ukrainian violations of the ceasefire in 11 locations using small arms, heavy machine guns, automatic grenade launchers, 73 mm antitank recoilless rifles, 82 mm mortars, 120 mm mortars, armoured personnel carriers and armoured fighting vehicles. Officials from the self-proclaimed Luhansk People's Republic recorded five Ukrainian violations of the ceasefire within the republic boundaries. The Ukrainian military employed small arms, heavy machine guns, under-barrel launched grenades, automatic grenade launchers, 73 mm antitank recoilless rifles, 82 mm mortars, 120 mm mortars and BMP-1 armoured vehicles to attack pro-Russian forces at Sokilnyky, Donetskyi, Zholobok, Kalynove and Kalynivka. According to the information provided by the press-centre of the JFO in the evening, from 7:00 am to 6:00 pm pro-Russian military had opened fire on positions of Ukrainian troops on 9 occasions, no casualties were reported. By the end of the day total 34 ceasefire violations were registered, as a result, one Ukrainian serviceman was killed and two others were wounded. In the outskirts of Donetsk city and in the region of Mariupol, 82 mm mortar round landed in Starohnativka and Lebedinske. Separatist forces used small arms, heavy machine guns and rocket launchers to harass Ukrainian troops at Vodiane, Lebedinske, Chermalyk, Starohnativka, Pavlopil, Novotroitske, Hnutove, Avdiivka, Bohdanivka, Shyrokyne, Krasnohorivka and Verkhnyotoretske. In the northern section of the demarcation line, 82 mm and 120 mm mortars were fired at Orekhove, while 82 mm mortar volleys struck Krymske, Novotoshkivke and Luhanske. Infantry weapons and rocke launchers were fired at Katerinivka, Luhanske, Orekhove, Novozvanivka, Novotoshkivke and Krymske. A series of ceasefire violations were reported by pro-Russian sources at Donetsk city by evening. Yasynuvata, Spartak, Trudivske, Kruta Balka, Dokuchaievsk, in the environs of Donetsk city, Zaitseve, in the area of Horlivka, and in the region of Mariupol, Sakhnaka, Bezimenne, Uzhivka and Pikuzy, came under attack. In the main incidents, BMP-2 armoured vehicles from Shyrokyne and Vodiane launched a number of attacks on pro-Russian positions at Sakhanka and Uzhivka with the support of 82 mm mortars, 120 mm mortars and antiaircraft guns. Yasynuvata and Pikuzy became the target of automatic grenade launchers. According to the information provided by the spokesman of the Ukrainian operational headquarters in the morning, pro-Russian troops had opened fire on 34 occasions on Ukrainian positions the previous day (including on 16 occasions in Donetsk region and on 18 occasions in Luhansk region); the fire was returned on more than 20 occasions. By morning of 3 October three ceasefire violations were registered with no casualties on the Ukrainian side. The spokesman of the Ministry of Defence confirmed at noon that one Ukrainian serviceman (born in 1981) was killed and two were wounded in action in the Donbass region on the second day of October. Pro-Russian officials at Donetsk city recorded 19 Ukrainian violations of the ceasefire in 11 different locations using small arms, heavy machine guns, automatic grenade launchers, 73 mm antitank recoilless rifles, antiaircraft artillery, armoured personnel carriers and armoured fighting vehicles. Sources from the self-proclaimed Luhansk People's Republic recorded 12 Ukrainian violations of the truce within the republic's borders. The Ukrainian miliitary used small arms, heavy machine guns, automatic grenade launchers, antitank rockets, 73 mm antitank recoilless rifles, 82 mm mortars, 120 mm mortars, BMP-1 armoured vehicles and 122 mm self-propelled artillery to engage pro-Russian forces at Sokilnyky, Donetskyi, Zholobok, Kalynove, Kalynivka, Lozove and Pryshyb. The press-centre of the JFO reported in the evening that from 7:00 am to 6:00 pm pro-Russian military had opened fire on positions of Ukrainian troops on 5 occasions. By the end of the day total 21 ceasefire violations were registered with no casualties on the Ukrainian side. Pro-Russian authorities from Donetsk city told the press that by evening Ukrainian forces had broken the ceasefire on several occasions. Staromykhailivka, Yasynuvata, Mineralne, Oleksandrivka, Spartak, Zhabicheve and Kruta Balka, in the surroundings of Donetsk city, Zaitseve, Gagarin mining complex and Ozeryanivka, in the area of Horlivka, and in the region of Mariupol, Zaichenko, Sakhanka and Uzhivka, came under hostile fire. In the main incidents, Sakhanka and Uzhivka came under 82 mm and 120 mm mortar fire, while 82 mm mortar rounds landed in Staromykhailivka and Kruta Balka. BMP-1 armoured vehicles and ZU-23-2 antiaircraft artillery from Shyrokyne opened fire on pro-Russian positions at Sakhnaka. BMP-1 armoured vehicles from Hnutove attacked Zaichenko. The spokesman of the Ukrainian operational headquarters reported in the morning, that pro-Russian troops had opened fire on 21 occasions on Ukrainian positions the previous day (including on 14 occasions in Donetsk region and on 7 occasions in Luhansk region); the fire was returned on several occasions. By noon of 4 October three ceasefire violations were registered with no casualties on the Ukrainian side. The spokesman of the Ministry of Defence reported at noon no casualties in the Donbass region on 3 October. Pro-Russian sources at Donetsk city reported 25 Ukrainian violations of the ceasefire in 16 locations using small arms, heavy machine guns, automatic grenade launchers, 73 mm antitank recoilless rifles, 82 mm mortars, 120 mm mortars, antiaircraft guns, armoured personnel carriers and armoured fighting vehicles. Officials from the self-proclaimed Luhansk People's Republic reported that Ukrainian forces broke the ceasefire two times within the republic boundaries. The Ukrainian military employed small arms, BMP-1 armoured vehicles and 122 mm self-propelled artillery to open fire on pro-Russian positions at Pryshyb and Sokilnyky. According to the information provided by the press-centre of the JFO in the evening, from 7:00 am to 6:00 pm pro-Russian military had opened fire on positions of Ukrainian troops on 9 occasions, as a result two Ukrainian servicemen were wounded; the fire was returned on several occasions. By the end of the day total 20 ceasefire violations were registered, one more Ukrainian soldier was wounded in action. A series of Ukrainian violations of the truce were reported by pro-Russian authorities at Donetsk city by evening. Trudivske, Yasynuvata, Volvo Center, Mineralne, Kruta Balka, Dokuchaievsk and Staromykhalivka, in the outskirts of Donetsk city, Gagarin mining complex and Shyroka Balka, in the area of Horlivka, and, in the region of Mariupol, Sakhanka, Pikuzy and Nova Tavrya, came under hostile fire. In the main incidents, Nova Tavrya became the target of 82 mm and 120 mm mortars, while Volvo Center and Trudivske were hit by 82 mm mortar rounds. BMP-1 armoured vehicles from Krasnohorivka opened fire on pro-Russian positions at Staromykhailivka, while BMP-2 armoured vehicles from Shyrokyne engaged pro-Russian forces at Sakhanka. ZU-23-2 antiaircraft guns shelled Yasynuvata. According to the information provided by the spokesman of the Ukrainian operational headquarters in the morning, pro-Russian troops had opened fire on 20 occasions on Ukrainian positions the previous day (including on 13 occasions in Donetsk region and on 7 occasions in Luhansk region); the fire was returned on several occasions. By morning of 5 October five ceasefire violations were registered, as a result, one Ukrainian serviceman was wounded. The spokesman of the Ministry of Defence confirmed at noon that three Ukrainian servicemen were wounded in action in the Donbass region on 4 October. Pro-Russian officials at Donetsk city reported 28 Ukrainian violations of the ceasefire in 15 locations using small arms, heavy machine guns, snipers, automatic grenade launchers, 73 mm antitank recoilless rifles, 82 mm mortars, 120 mm mortars, armoured personnel carriers and armoured fighting vehicles. Officials from the self-proclaimed Luhansk People's Republic reported that Ukrainian forces broke the ceasefire two times within the republic boundaries. Ukrainian 122 mm self-propelled artillery from Kryakivka shelled Pryshyb, while BMP-1 armoured vehicles from Krymske, supported by infantry weapons, engaged pro-Russian positions at Sokilnyky. The press-centre of the JFO reported in the evening that from 7:00 am to 6:00 pm pro-Russian military had opened fire on positions of Ukrainian troops on 4 occasions, another Ukrainian soldier was wounded. By the end of the day total 19 ceasefire violations were registered. A series of Ukrainian violations of the ceasefire were reported by pro-Russian authorities at Donetsk city by evening. Spartak, Kruta Balka, Dokuchaievsk, Yasynuvata, Donetsk airport and Trudivske, in the environs of Donetsk city, Zaitseve, Gagarin mining complex and Shyroka Balka, in the area of Horlivka, and, in the region of Mariupol, Sakhanka, Pikuzy and Bezimenne, came under attack. In the main incidents, Bezimenne, Pikuzy, Sakhanka, Yasynuvata, Donetsk airport and Shyroka Balka became the target of 120 mm mortars. Donetsk airport was shelled with 82 mm mortars. BMP-2 armoured vehicles opened fire on pro-Russian redoubts at Spartak. The spokesman of the Ukrainian operational headquarters reported in the morning, that pro-Russian troops had opened fire on 19 occasions on Ukrainian positions the previous day (including on 9 occasions in Donetsk region and on 10 occasions in Luhansk region); the fire was returned on 8 occasions. By morning of 6 October (as of 9:00 am) four ceasefire violations were registered with no casualties on the Ukrainian side; the fire was not returned. The spokesman of the Ministry of Defence confirmed at noon that two Ukrainian servicemen were wounded in action in the Donbass region on 5 October. Pro-Russian authorities at Donetsk city reported 26 Ukrainian violations of the ceasefire in 12 locations using small arms, heavy machine guns, automatic grenade launchers, 73 mm antitank recoilless rifles, 82 mm mortars, 120 mm mortars, armoured personnel carriers and armoured fighting vehicles. Sources from the self-proclaimed Luhansk People's Republic reported that Ukrainian forces broke the ceasefire six times within the republic boundaries. The Ukrainian military employed small arms, armoured fighting vehicles and 122 mm self-propelled artillery to engage pro-Russian positions at Lozove, Nyzhnie Lozove, Sokilnyky and Zholobok. According to the information provided by the press-centre of the JFO in the evening, from 7:00 am to 6:00 pm pro-Russian military had opened fire on positions of Ukrainian troops on 9 occasions, as a result, two Ukrainian soldiers were wounded; the fire was returned on several occasions. By the end of the day total 25 ceasefire violations were registered. Pro-Russian officials told the press that Ukrainian forces had broken the ceasefire several times by evening. The Ukrainian military attacked Yasynuvata, Volvo Center, Donetsk airport, Trudivske and Spartak, in the surroundings of Donetsk city, Dolomitne, Izotove mining complex and Shyroka Balka, in the area of Horlivka, and, in the region of Mariupol, Sakhanka, Uzhivka, Pikuzy and Nova Tavrya. In the main incidents, 120 mm mortar rounds hit Pikuzy, Sakhanka and Donetsk airport, while 82 mm mortars were fired at Uzhivka and Sakhanka. BMP-2 armoured vehicles from Novoluhanske and Lebedinske engaged pro-Russian positions at Dolomitne and Uzhivka, respectively. According to the information provided by the spokesman of the Ukrainian operational headquarters in the morning, pro-Russian troops had opened fire on 25 occasions on Ukrainian positions the previous day (including on 19 occasions in Donetsk region and on 6 occasions in Luhansk region); the fire was returned on 9 occasions. By morning of 7 October (as of 11:00 am) three ceasefire violations were registered, the fire was returned on 2 occasions. The spokesman of the Ministry of Defence confirmed at noon that two Ukrainian servicemen were wounded in action in the Donbass region on 6 October. Pro-Russian officials at Donetsk city reported 21 Ukrainian violations of the ceasefire in 12 locations using small arms, heavy machine guns, snipers, automatic grenade launchers, 73 mm antitank recoilless rifles, 82 mm mortars, 120 mm mortars, antiaircraft guns, armoured personnel carriers and armoured fighting vehicles. One civilian resident was critically wounded by sniper fire and a pro-Russian soldier was killed in action. According to local sources, the Ukrainian military broke the ceasefire twice within the borders of the self-styled Luhansk People's Republic. The Ukrainian military employed small arms, automatic grenade launchers, antitank rockets and BMP-1 armoured vehicles to engage pro-Russian positions at Holubovske and Kalynivka. The press-centre of the JFO reported in the evening that from 7:00 am to 6:00 pm pro-Russian military had opened fire on positions of Ukrainian troops on 8 occasions, no casualties were reported. By the end of the day total 27 ceasefire violations were registered, no casualties were reported. In the outskirts of Donetsk city and in the region of Mariupol, pro-Russian armoured fighting vehicles from Uzhivka launched an attack on Ukrainian positions at Vodiane, supported by 120 mm mortars and 122 mm self-propelled artillery. Armoured fighting vehicles opened fire on Ukrainian forces at Lebedinske, that also came under 120 mm mortar fire. Hnutove was hit by 82 mm mortar rounds. Infantry weapons and grenade launchers were fired at Shyrokyne, Hnutove, Novotroitske, Novomikhailivka and Krasnohorivka. In the northern sector of the demarcation line, 120 mm mortar volleys landed in Novoluhanske, Luhanske and Svitlodarsk, while Novotoshkivke and Luhanske were hit by 82 mm mortar rounds. Ukrainian redoubts at Krymske and Novozvanivka were engaged by armoured fighting vehicles. ZU-23-2 antiaircraft guns opened fire on Ukrainain troops at Svobodne, while small arms, heavy machine guns and rocket launchers were used against Ukrainian positions at Katerinivka, Novotoshkivke, Svobodne and Svitlodarsk. Pro-Russian authorities reported several Ukrainian violations of the truce by evening. Yasynuvata, Trudivske, Spartak, Kruta Balka, Volvo Center, Staromykhailivka and Oleksandrivka, in the outskirts of Donetsk city, Gagarin mining complex, 6/7 coal mine and Dolomitne, and, in the region of Mariupol, Pikuzy, Sakhanka and Uzhivka, came under hostile fire. In the main incidents, 120 mm mortar volleys landed in 6/7 coal mine, while Dolomitne became the target of ZU-23-2 antiaircraft guns. Staromykhailivka was hit by 73 mm antitank recoilless rifles. The spokesman of the Ukrainian operational headquarters reported in the morning, that pro-Russian troops had opened fire on 27 occasions on Ukrainian positions the previous day (including on 15 occasions in Donetsk region and on 12 occasions in Luhansk region); the fire was returned on almost all occasions. By morning of 8 October six ceasefire violations were registered with no casualties on the Ukrainian side. The spokesman of the Ministry of Defence reported at noon no casualties in the Donbass region on 7 October. Pro-Russian officials at Donetsk city recorded 25 Ukrainian violations of the ceasefire in 16 different locations using small arms, heavy machine guns, automatic grenade launchers, 73 mm antitank recoilless rifles, 82 mm mortars, 120 mm mortars and antiaircraft artillery. Authorities from the self-proclaimed Luhansk People's Republic recorded seven Ukrainian violations of the truce within the republic boundaries. The Ukrainian miliitary used small arms, heavy machine guns, automatic grenade launchers, antitank rockets, 73 mm antitank recoilless rifles, 82 mm mortars, 120 mm mortars and BMP-1 armoured vehicles to engage pro-Russian forces at Kalynivka, Kalynove, Sokilnyky, Donetskyi, Lozove and Mykhailivka. According to the information provided by the press-centre of the JFO in the evening, from 7:00 am to 6:00 pm pro-Russian military had opened fire on positions of Ukrainian troops on 9 occasions, as a result two Ukrainian soldiers were wounded; the fire was returned on several occasions. By the end of the day total 36 ceasefire violations were registered, one more Ukrainian serviceman was wounded. In the environs of Donetsk city and in the region of Mariupol, pro-Russian armoured fighting vehicles, supported by 120 mm mortar fire, grenade launchers and infantry weapons attacked Ukrainian positions at Lebedinske and Vodiane. Hnutove, Pavlopil, Avdiivka, Marinka, Krasnohorivka, Novomikhailivka and Piski became the target of small arms, heavy machine guns and rocket launchers. in the northern section of the demarcation line, Luhanske was struck by 82 mm and 120 mm mortar volleys, while Maisk and Novotoshkivke were shelled with 82 mm mortars. Ukrainian forces at Troitske and Novotoshkivke were engaged by armoured fighting vehicles. The separatists fired ZU-23-2 antiaircraft guns at Ukrainian redoubts around Shyrokyne. Ukrainian troops became the target of infantry weapons and grende launchers at Katerinivka, Krymske, Luhanske and Stepne. Pro-Russian officials from Donetsk city told the press that Ukrainian forces had broken the ceasefire on several occasions throughout the day. Kruta Balka, Spartak, Yakovliivka, Trudivske, Oleksandrivka, and Yasynuvata, in the environs of Donetsk city, Zaitseve, Ozeryanivka and Dolomitne, in the area of Horlivka, and in the region of Mariupol, Sakhanka, Pikuzy and Uzhivka, came under hostile fire. in the main incidents, 120 mm mortar volleys hit Ozeryanivka and Pikuzy, while 82 mm mortars were fired at Uzhivka and Pikuzy. BMP-2 armoured vehicles from Marinka launched a sustained attack on pro-Russian positions at Oleksandrivka supported by automatic grenade launchers. BMP-2 armoured vehicles from Avdiivka also engaged pro-Russian troops at Spartak. According to the information provided by the spokesman of the Ukrainian operational headquarters in the morning, pro-Russian troops had opened fire on 36 occasions on Ukrainian positions the previous day (including on 23 occasions in Donetsk region and on 13 occasions in Luhansk region); the fire was returned on 17 occasions. By morning of 9 October (as of 9:00 am) four ceasefire violations were registered with no casualties on the Ukrainian side, the fire was not returned. An ammunition depot in Ichnia (Chernihiv Oblast) exploded in the early hours of 9 October. The spokesman of the Ministry of Defence confirmed at noon that three Ukrainian servicemen were wounded in action in the Donbass region on 8 October. Pro-Russian authorities at Donetsk city reported 28 Ukrainian violations of the ceasefire in 12 locations using small arms, heavy machine guns, automatic grenade launchers, 73 mm antitank recoilless rifles, 82 mm mortars, 120 mm mortars, antiaircraft guns, armoured personnel carriers and armoured fighting vehicles. Sources from the self-proclaimed Luhansk People's Republic recorded eight Ukrainian violations of the truce within the republic boundaries. The Ukrainian military used small arms, heavy machine guns, automatic grenade launchers, antitank rockets, 73 mm antitank recoilless rifles, 82 mm mortars, 120 mm mortars and BMP-1 armoured vehicles to attack pro-Russian redoubts at Zholobok, Donetskyi, Pryshyb, Kalynove, Kalynove-Borshchevate and Kalynivka. The press-centre of the JFO reported in the evening that from 7:00 am to 6:00 pm pro-Russian military had opened fire on positions of Ukrainian troops on 16 occasions, one Ukrainian soldier was wounded. By the end of the day total 39 ceasefire violations were registered, as a result, one Ukrainian soldier was killed and one more Ukrainian serviceman was wounded. in the outskirts of Donetsk city and in the region of Mariupol, heavy shelling was reported on Ukrainian positions at Hnutove, Vodiane and Lebedinske, which became the target of 82 mm mortars, 120 mm mortars and 122 mm self-propelled artillery. Infantry weapons were used to harass Ukrainian troops at Syiroyine, Pavlopil, Lebedinske, Hnutove, Krasnohorivka and Marinka. in the northern sector of the demarcation line, 152 mm artillery volleys landed in Novotoshkivke, while Luhanske and Novoluhanske became the target of 82 mm and 120 mm mortars. Antitank guided missiles were fired at Ukrainian positions around Zolote. Pro-Russian officials at Donetsk city reported a number of Ukrainian violations of the truce by evening. The Ukrainian military targeted Spartak, Kashtanove, Kruta Balka, Mineralne, Vasilyevka, Yasynuvata and Oleksandrivka, in the surroundings of Donetsk city; Gagarin mining complex, Shyroka Balka, Zaitseve and Ozeryanivka, in the area of Horlivka, and Sakhanka, Pikuzy, Uzhivka, Novolaspa, Bezimenne and Dzezhinske, in the region of Mariupol. In the main incidents, separatist forces became the target of 120 mm mortars at Uzhivka, Vasilyevka, Spartak, Bezimenne and Dzerzhinske. Spartak and Sakhanka also came under 82 mm mortar fire. BMP-1 armoured vehicles from Shumy, Talakivka and Starohnativka engaged pro-Russian redoubts at Gagarin mining complex, Pikuzy and Novolaspa, respectively. BMP-2 armoured vehicles, meanwhile, raked with 30 mm gunfire Ukrainian positions at Spartak and Mineralne. ZU-23-2 were fired at Yasynuvata and Kashtanove. The spokesman of the Ukrainian operational headquarters reported in the morning, that pro-Russian troops had opened fire on 39 occasions on Ukrainian positions the previous day (including on 25 occasions in Donetsk region and on 14 occasions in Luhansk region). By morning of 10 October (as of 9:00 am) four ceasefire violations were registered with no casualties on the Ukrainian side. The spokesman of the Ministry of Defence confirmed at noon that one Ukrainian serviceman was killed and two others had suffered minor injuries in action in the Donbass region on 9 October. Pro-Russian authorities at Donetsk city reported 24 Ukrainian violations of the ceasefire in 18 locations using small arms, heavy machine guns, snipers, automatic grenade launchers, 73 mm antitank recoilless rifles, 82 mm mortars, 120 mm mortars, antiaircraft guns, armoured personnel carriers and armoured fighting vehicles. According to local sources, the Ukrainian military broke the ceasefire 11 times within the borders of the self-styled Luhansk People's Republic. The Ukrainian military employed small arms, heavy machine guns, automatic grenade launchers, 73 mm antitank recoilless rifles, 82 mm mortars and BMP-1 armoured vehicles to engage pro-Russian positions at Sentianivka, Lozove, Kalynove, Kalynivka, Sokilnyky and Donetskyi. According to the information provided by the press-centre of the JFO in the evening, from 7:00 am to 6:00 pm pro-Russian military had opened fire on positions of Ukrainian troops on 10 occasions, as a result one Ukrainian soldier was wounded; two servicemen were killed in Donetsk region by a landmine explosion. By the end of the day total 28 ceasefire violations were registered, two Ukrainian servicemen were killed and two more were wounded. In the environs of Donetsk city and in the region of Mariupol, Krasnohorivka was hit by 120 mm mortar fire, while 82 mm mortar rounds landed in Lebedinske. Pro-Russian forces launched antitank guided missiles at Ukrainian positions at Hnutove. Starohnativka, Lebedinske, Krasnohorivka, Troitske, Avdiivka, Hnutove and Novomykhailivka became the target of small arms, heavy machine guns and grenade launchers. In the northern sector of the demarcation line, Maiske, Krymske, Novotoshkivke and Novoluhanske were shelled with 120 mm mortars; Krymske, Novotoshkivke and Novoluhanske were also hit by 82 mm mortar fire. Pro-Russian armoured fighting vehicles attacked Ukrainina redoubts at Maiske and Krymske. Antitank guided missiles landed in Zolote. ZU-23-2 antiaircraft guns were fired at Novotoshkivke. Ukrainian troops at Stepne and Zaitseve were harassed with heavy machine gun fire. A series of Ukrainian violations of the ceasefire were reported by pro-Russian authorities at Donetsk city by evening. Trudivske, Kruta Balka and Staromykhailivka, in the area around Donetsk city, Shyroka Balka, Holmivsky and Gagarin mining complex, in the area of Horlivka, and, in the region of Mariupol, Sakhanka, Uzhivka and Pikuzy, came under attack. Most incidents involved the use of infantry weapons, automatic grenade launchers and 73 mm antitank recoilless rifles. Local authorities said that BM-21 "Grad" artillery rockets landed in Kruta Balka, damaging several civilian residences. Sakhanka was hit by 120 mm mortar barrages, while 82 mm mortar rounds landed in nearby Uzhivka. At night, BMP-2 armoured vehicles from Krasnohorivka engaged pro-Russian positions at Staromykhailivka with 30 mm gunfire. A Ukrainian "Leleka-100" drone was shot down over Staromykhailivka while directing mortar fire on pro-Russian positions. According to the information provided by the spokesman of the Ukrainian operational headquarters in the morning, pro-Russian troops had opened fire on 28 occasions on Ukrainian positions the previous day (including on 20 occasions in Donetsk region and on 8 occasions in Luhansk region); the fire was returned on 17 occasions. By morning of 11 October (as of 9:00 am) three ceasefire violations were registered with no casualties on the Ukrainian side, the fire was not returned. The spokesman of the Ministry of Defence confirmed at noon that two Ukrainian servicemen were killed, three were wounded, and two were lethally injured by the explosion of a landmine in the Donbass region on 10 October. Pro-Russian sources at Donetsk city reported 22 Ukrainian violations of the ceasefire in 12 locations using small arms, heavy machine guns, snipers, automatic grenade launchers, 73 mm antitank recoilless rifles, 82 mm mortars, 120 mm mortars, armoured personnel carriers and armoured fighting vehicles. Officials from the self-proclaimed Luhansk People's Republic reported that Ukrainian forces broke the ceasefire three times within the republic boundaries. BMP-1 armoured vehicles from Krymske launched a sustained attack on pro-Russian positions at Smile, while automatic grenaade launchers and 73 mm antitank recoilless rifles fired from Svitlodarsk hit Lozove. BMP-1 from Luhanske also opened up on pro-Russian forces at Kalynivka. The press-centre of the JFO reported in the evening that from 7:00 am to 6:00 pm pro-Russian military had opened fire on positions of Ukrainian troops on 9 occasions. By the end of the day total 27 ceasefire violations were registered with no casualties on the Ukrainian side. In the surroundings of Donetsk city and in the region of Mariupol, Chermalyk, Hnutove and Lebedinske came under 82 mm and 120 mm mortar fire. Pro-Russian armoured fighting vehicles from Uzhivka engaged Ukrainian positions at Vodiane. Infantry weapons were employed by the separatists to harass Ukrainian troops at Marinka, Vodiane, Krasnohorivka, Pavlopil and Shyrokyne. In the northern section of the demarcation line, Lohvynove became the target of 82 mm and 120 mm mortars, while 82 mm mortar rounds landed in Svitlodarsk. Separatists forces opened fire on Ukrainian positions at Novozvanivka, Krymske and Novozvanivka using heavy machine guns and rocket launchers. Pro-Russian authorities told the press that Ukrainian forces had broken the ceasefire on several occasions by evening. Ukrainian forces attacked Spartak, Oleksandrivka and Donetsk airport, in the outskirts of Donetsk city, Zaitseve and Izotove, in the area of Horlivka, and, in the region of Mariupol, Sakhanka, Uzhivka and Pikuzy. In the main incidents, 82 mm and 120 mm mortar barrages repeatedly hit Sakhanka, Pikuzy and Uzhivka; 120 mm mortar rounds landed also in Izotove. Spartak was shelled with 82 mm mortars. BMP-1 armoured vehicles from Shyrokyne attacked Sakhanka; the village also became the target of ZU-23-2 antiaircraft guns. BMP-2 armoured vehicles from Vodiane opened fire on Uzhivka. Two Ukrainian drones were shot down over Pikuzy and Sakhanka while in the process of dropping bombs on pro-Russian positions. The spokesman of the Ukrainian operational headquarters reported in the morning, that pro-Russian troops had opened fire on 27 occasions on Ukrainian positions the previous day (including on 20 occasions in Donetsk region and on 7 occasions in Luhansk region); the fire was returned on 9 occasions. By morning of 12 October (as of 11:00 am) eight ceasefire violations were registered with no casualties on the Ukrainian side. The spokesman of the Ministry of Defence reported at noon no casualties in the Donbass region on the first day 11 October. Pro-Russian authorities at Donetsk city reported 27 Ukrainian violations of the ceasefire in 12 locations using small arms, heavy machine guns, snipers, automatic grenade launchers, 73 mm antitank recoilless rifles, 82 mm mortars, 120 mm mortars, antiaircraft guns, armoured personnel carriers and armoured fighting vehicles. In the same release to the press, pro-Russian officials said that Ukrainian forces had broken the truce on 71 occasions over the past week. During that period. Ukrainian troops fired 308 rounds from 82 mm and 120 mm mortars, and also employed armoured fighting vehicles to engage pro-Russian forces. One pro-Russian soldier was killed in action and a civilian resident was wounded. According to local sources, the Ukrainian military broke the ceasefire twice within the borders of the self-styled Luhansk People's Republic. The Ukrainian military employed heavy machine guns, automatic grenade launchers, 120 mm mortars and BMP-1 armoured vehicles to engage pro-Russian positions at Lozove. According to the information provided by the press-centre of the JFO in the evening, from 7:00 am to 6:00 pm pro-Russian military had opened fire on positions of Ukrainian troops on 13 occasions, no casualties were reported. By the end of the day total 26 ceasefire violations were registered, one Ukrainian serviceman suffered minor injuries as a result. Pro-Russian authorities reported several Ukrainian violations of the truce by evening. Zhabicheve, Kruta Balka, Staromykhailivka, Yakovliivka, Spartak and Kruta Balka, in the environs of Donetsk city, Zaitseve, Gagarin mining complex, Holmivsky and Shyroka Balka, in the area of Horlivka, and, in the region of Mariupol, Petrovske, Uzhivka and Sakhanka, came under hostile fire. In the main incidents, Zaitseve was hit by 120 mm mortar fire, while 82 mm mortar rounds landed in Spartak and Gagarin mining complex. BMP-1 armoured vehicles from Bohdanivka, Shyrokyne and Novhorodske engaged Ukrainian positions around Petrovske, Sakhanka and Shyroka Balka. BMP-1 armoured vehicles from Travneve opened fire meanwhile at Ukrainian forces in Holmivsky. ZU-23-2 antiaircraft guns were fired at Kruta Balka and Spartak. According to the information provided by the spokesman of the Ukrainian operational headquarters in the morning, pro-Russian troops had opened fire on 26 occasions on Ukrainian positions the previous day (including on 19 occasions in Donetsk region and on 7 occasions in Luhansk region); the fire was returned on 11 occasions. By morning of 13 October (as of 11:00 am) five ceasefire violations were registered with no casualties on the Ukrainian side, the fire was returned once. The spokesman of the Ministry of Defence confirmed at noon that one Ukrainian serviceman was wounded in the Donbass region on 12 October. Pro-Russian authorities at Donetsk city reported 22 Ukrainian violations of the ceasefire in 15 locations using small arms, heavy machine guns, snipers, automatic grenade launchers, 73 mm antitank recoilless rifles, 82 mm mortars, 120 mm mortars, antiaircraft guns, armoured personnel carriers and armoured fighting vehicles. Officials from the self-proclaimed Luhansk People's Republic recorded four Ukrainian violations of the truce within the republic boundaries. Ukrainian forces employed heavy machine guns, 82 mm mortars, 120 mm mortars and BMP-1 armoured vehicles to attack Mariivka, Kalynove, Sentianivka and Holubovske. The press-centre of the JFO reported in the evening that from 7:00 am to 6:00 pm pro-Russian military had opened fire on positions of Ukrainian troops on 11 occasions, the fire was returned on several occasions. By the end of the day total 26 ceasefire violations were registered with no casualties on the Ukrainian side. A series of Ukrainian ceasefire violations were recorded by pro-Russian sources at Donetsk city by evening. Spartak, Trudivske, Kruta Balka and Mineralne, in the outskirts of Donetsk city, Shyroka Balka, Zaitseve and Gagarin mining complex, in the area of Horlivka, and, in the region of Mariupol, Sakhanka, Pikuzy, Nova Tavrya, Zaichenko and Uzhivka. Most incidents involved the use of infantry weapons and automatic grenade launchers. BMP-1 armoured fighting vehicles engaged pro-Russian positions at Spartak supported by 82 mm mortar fire; while 120 mm mortar rounds landed in Nova Tavrya and Uzhivka. Kruta Balka received fire from 73 mm antitank recoilless rifles. The spokesman of the Ukrainian operational headquarters reported in the morning, that pro-Russian troops had opened fire on 26 occasions on Ukrainian positions the previous day (including on 16 occasions in Donetsk region and on 10 occasions in Luhansk region); the fire was returned on 13 occasions. By morning of 14 October (as of 7:00 am) six ceasefire violations were registered, one Ukrainian soldier was wounded at Krymske as a result. The spokesman of the Ministry of Defence reported at noon no casualties in the Donbass region on 13 October. Pro-Russian authorities at Donetsk city reported 19 Ukrainian violations of the ceasefire in 13 locations using small arms, heavy machine guns, automatic grenade launchers, 73 mm antitank recoilless rifles, 82 mm mortars, 120 mm mortars, armoured personnel carriers and armoured fighting vehicles. Sources from the self-proclaimed Luhansk People's Republic recorded four Ukrainian violations of the truce within the republic boundaries. The Ukrainian military used antitank rocket launchers, 82 mm mortars and 120 mm mortars to attack pro-Russian forces at Sokilnyky, Lozove, Zholobok and Mariivka. Two female civilians, a mother and her teenager daughter, were killed when their home was hit by a 120 mm mortar round at Mariivka. According to the information provided by the press-centre of the JFO in the evening, from 7:00 am to 6:00 pm pro-Russian military had opened fire on positions of Ukrainian troops on 11 occasions, as a result, two more Ukrainian servicemen were wounded. By the end of the day total 23 ceasefire violations were registered. A number of Ukrainian violations of the truce were reported by pro-Russian officials at Donetsk city by evening. Ukrainian forces attacked Yasynuvata and Spartak, in the surroundings of Donetsk city, Dolomitne and Zaitseve, in the area of Horlivka, and, in the region of Mariupol, Sakhanka and Uzhivka. In the main incidents, Dolomitne was hit by 120 mm mortar fire, while 82 mm mortar barrages landed in Sakhanka and Uzhivka. According to the information provided by the spokesman of the Ukrainian operational headquarters in the morning, pro-Russian troops had opened fire on 23 occasions on Ukrainian positions the previous day (including on 18 occasions in Donetsk region and on 5 occasions in Luhansk region); the fire was returned on several occasions. By the morning of 15 October (as of 9:00 am) three ceasefire violations were registered, as a result, one Ukrainian serviceman was wounded. The spokesman of the Ministry of Defence confirmed at noon that three Ukrainian servicemen were wounded in the Donbass region on 14 October. Pro-Russian authorities at Donetsk city reported 17 Ukrainian violations of the ceasefire in nine locations using small arms, heavy machine guns, automatic grenade launchers, 73 mm antitank recoilless rifles, 82 mm and 120 mm mortars. An inmate at the prison of Michurinske, near Horlivka, was killed when the correctional facility received heavy machine gun fire from a Ukrainian trench. Officials from the self-proclaimed Luhansk People's Republic recorded seven Ukrainian violations of the truce within the republic boundaries. The Ukrainian miliitary used small arms, heavy machine guns, automatic grenade launchers, antitank rockets, 73 mm antitank recoilless rifles, 82 mm mortars, 120 mm mortars and BMP-1 armoured vehicles to engage pro-Russian forces at Kalynivka, Mariivka, Sentianivka, Zholobok and Lozove. The press-centre of the JFO reported in the evening that from 7:00 am to 6:00 pm pro-Russian military had opened fire on positions of Ukrainian troops on 9 occasions, as a result, one Ukrainian serviceman was killed and one Ukrainian soldier was wounded. By the end of the day total 37 ceasefire violations were registered, one more Ukrainian serviceman was wounded. Pro-Russian sources from Donetsk city reported a series of Ukrainian violations of the ceasefire throughout the day. The Ukrainian military attacked Kruta Balka, Spartak, Volvo Center, Donetsk airport, Yasynuvata, Trudivske, Mineralne, Abakumove coal mine, Kashtanove, Oleksandrivka and Luhanske, in the environs of Donetsk city, Gagarin mining complex, Shyroka Balka, Izotove mining complex, Holmivsky and Zaitseve, in the area of Horlivka, and, in the region of Mariupol, Sakhanka and Pikuzy. In the main incidents, 82 mm and 120 mm mortar volleys hit Pikuzy, while 82 mm mortar rounds landed in Spartak. BMP-1 armoured vehicles from Avdiivka, Novomykhailivka and Novhorodske engaged pro-Russian positions at Yasynuvata, Luhanske and Shyroka Balka, respectively. BMP-2 vehicles from Shyrokyne, Shumy, Marinka and Novooleksandrivka also opened fire at Sakhanka, Izotove, Trudivske and Oleksandrivka. Ukrainian forces fired ZU-23-2 antiaircraft guns on pro-Russian redoubts at Kruta Balka, Mineralne and Spartak. The spokesman of the Ukrainian operational headquarters reported in the morning, that pro-Russian troops had opened fire on 37 occasions on Ukrainian positions the previous day (including on 28 occasions in Donetsk region and on 9 occasions in Luhansk region); the fire was returned on 14 occasions. By morning of 16 October (as of 11:00 am) five ceasefire violations were registered with no casualties on the Ukrainian side. The spokesman of the Ministry of Defence confirmed at noon that one Ukrainian serviceman (born in 1991) was killed and another three were wounded in action in the Donbass region on 15 October. Pro-Russian authorities at Donetsk city reported 26 Ukrainian violations of the ceasefire in 19 locations using small arms, heavy machine guns, automatic grenade launchers, 73 mm antitank recoilless rifles, 82 mm mortars, 120 mm mortars, antiaircraft guns, armoured personnel carriers and armoured fighting vehicles. According to local sources, the Ukrainian military broke the ceasefire seven times within the borders of the self-styled Luhansk People's Republic. The Ukrainian military employed small arms, heavy machine guns, automatic grenade launchers, antitank rockets, 82 mm mortars, 120 mm mortars, BMP-1 armoured vehicles and 122 mm self-propelled artillery to engage pro-Russian positions at Kalynove, Kalynivka, Lozove, Mykhailivka, Donetskyi and Sokilnyky. According to the information provided by the press-centre of the JFO in the evening, from 7:00 am to 6:00 pm pro-Russian military had opened fire on positions of Ukrainian troops on 6 occasions. By the end of the day total 19 ceasefire violations were registered, two Ukrainian servicemen were killed in action, one soldier was wounded. In the outskirts of Donetsk city and in the region of Mariupol, Vodiane came under 120 mm mortar fire. Sniper fire was reported at Marinka and Berezove. Infantry weapons and rocket launchers were fired at Pavlopil, Pisky, Vodiane, Chermalyk, Lebedinske, Shyrokyne, Hnutove, Marinka and Berezove. In the northern section of the demarcation line, pro-Russian armoured fighting vehicles attacked Ukrainian positions at Luhanske supported by 82 mm and 120 mm mortars. Ukrainian troops at Novozvanivka and Luhanske became the target of small arms, heavy machine guns and rocket launchers. A series of Ukrainian violations of the ceasefire were reported by pro-Russian officials at Donetsk city by evening. Trudivske, Mineralne, Oleksandrivka, Staromykhailivka and Spartak, in the surroundings of Donetsk city, Zaitseve and Gagarin mining complex, in the area of Horlivka, and, in the region of Mariupol, Pikuzy, Nova Tavrya, Uzhivka and Novoshyrokivske came under attack. Heavy shelling took place in the region of Mariupol; 82 mm and 120 mm mortar volleys landed in Pikuzy, while Novoshyrokivske was hit by 120 mm mortar rounds. Uzhivka, meanwhile, came under 82 mm mortar fire. BMP-1 armoured vehicles from Talakivka opened fire on pro-Russian positions at Pikuzy. BMP-2 armoured vehicles from Vodiane engaged Ukrainian positions at Nova Tavrya. According to the information provided by the spokesman of the Ukrainian operational headquarters in the morning, pro-Russian troops had opened fire on 19 occasions on Ukrainian positions the previous day (including on 16 occasions in Donetsk region and on 3 occasions in Luhansk region); the fire was returned on 7 occasions. By morning of 17 October (as of 9:00 am) four ceasefire violations were registered with no casualties on the Ukrainian side, the fire was not returned. The spokesman of the Ministry of Defence confirmed at noon that two Ukrainian servicemen were killed and one was wounded in the Donbass region on 16 October. Pro-Russian sources at Donetsk city reported 24 Ukrainian violations of the ceasefire in 13 locations using small arms, heavy machine guns, automatic grenade launchers, 73 mm antitank recoilless rifles, 82 mm mortars, 120 mm mortars, armoured personnel carriers and armoured fighting vehicles. Several civilian residences, gas pipelines and powerlines were damaged. Officials from the self-proclaimed Luhansk People's Republic recorded four Ukrainian violations of the truce within the republic boundaries. The Ukrainian military used small arms, heavy machine guns, antitank rocket launchers, 73 mm antitank rocket launchers, 82 mm mortars, 120 mm mortars and BMP-1 armoured vehicles to attack pro-Russian forces at Mykhailivka and Kalynivka. The press-centre of the JFO reported in the evening that from 7:00 am to 6:00 pm pro-Russian military had opened fire on positions of Ukrainian troops on 9 occasions, one Ukrainian serviceman suffered minor injuries as a result; the fire was returned on several occasions. By the end of the day total 17 ceasefire violations were registered, another Ukrainian soldier was wounded. In the area around Donetsk city and in the region of Mariupol, Talakivka was hit by 120 mm mortar volleys, while 82 mm mortars were fired at Ukrainian forces at Hnutove, Lebedinske and Shyrokyne. Inafantry weapons and grenade launchers were employed to harass Ukrainian troops at Avdiivka, Novotroitske, Verkhnyotoretske, Novomykhailivka, Starohnativka and Pavlopil. In the northern sector of the demarcation line, heavy machine gun fire was reported at Katerinivka, while infantry weapons, rocket launchers and 82 mm mortars were fired at Novoluhanske. Pro-Russian authorities from Donetsk city told the press that Ukrainian forces continued to break the ceasefire throughout the day. The Ukrainian military carried out attacks on Spartak, Yasynuvata and Staromykhailivka, in the outskirts of Donetsk city, Zaitseve, Gagarin mining complex and Shyroka Balka, in the area of Horlivka, and, in the region of Mariupol, Sakhanka and Pikuzy. Once again, heavy shelling was reported around Mariupol, where 120 mm mortar volleys landed in Pikuzy. Sakhanka was likewise repeatedly hit by 82 mm mortar barrages. BMP-2 armoured vehicles from Novhorodske and Krasnohorivka engaged pro-Russian positions at Shyroka Balka and Staromykhailivka, respectively. Spartak was shelled with 73 mm antitank recoilless rifles and 82 mm mortars. The spokesman of the Ukrainian operational headquarters reported in the morning, that pro-Russian troops had opened fire on 17 occasions on Ukrainian positions the previous day (including on 15 occasions in Donetsk region and twice in Luhansk region); the fire was returned on several occasions. By morning of 18 October (as of 11:00 am) eleven ceasefire violations were registered with no casualties on the Ukrainian side. The spokesman of the Ministry of Defence confirmed at noon that two Ukrainian servicemen were wounded in action in the Donbass region on 17 October. Pro-Russian authorities at Donetsk city reported 26 Ukrainian violations of the ceasefire in 13 locations using small arms, heavy machine guns, automatic grenade launchers, 73 mm antitank recoilless rifles, 82 mm mortars, 120 mm mortars, antiaircraft guns, armoured personnel carriers and armoured fighting vehicles. Local sources from the self-styled Luhansk People's Republic reported heavy shelling on the village of Sokilnyky, which was hit by 120 mm mortar barrages. According to the information provided by the press-centre of the JFO in the evening, from 7:00 am to 6:00 pm pro-Russian military had opened fire on positions of Ukrainian troops on 4 occasions. By the end of the day total 16 ceasefire violations were registered, no casualties were reported. A series of Ukrainian violations of the ceasefire were reported by pro-Russian officials at Donetsk city by evening. Spartak, Staromykhailivka, Zhabicheve, Donetsk airport, Yasynuvata, Kruta Balka and Lozove, in the area around Donetsk city, and, in the area of Horlivka, Zaitseve, Verkhnyotoretske, Holmivsky and Izotove mining complex, came under hostile fire. In the main incidents, Zaitseve came under 82 mm mortar fire, while Donetsk airport was targeted by ZU-23-2 antiaircraft guns. BMP-1 armoured vehicles from Travneve engaged pro-Russian redoubts at Homivsky. BMP-2 armoured vehicles raked pro-Russian positions at Zaitseve with 30 mm gunfire. Two civilian residents, a man and his wife, were killed by the explosion of a anti personnel mines while trying to fix a powerline in a no-man-land area near Zolote. The bodies were recovered by Pro-Russian soldiers from Luhansk People's Republic on 22 October. According to the information provided by the spokesman of the Ukrainian operational headquarters in the morning, pro-Russian troops had opened fire on 16 occasions on Ukrainian positions the previous day (including on 14 occasions in Donetsk region and on 2 occasions in Luhansk region); the fire was returned twice. By morning of 19 October three ceasefire violations were registered, as a result, one Ukrainian serviceman was wounded. The spokesman of the Ministry of Defence reported at noon no casualties in the Donbass region on 18 October. Pro-Russian authorities at Donetsk city reported 19 Ukrainian violations of the ceasefire in 13 locations using small arms, heavy machine guns, snipers, automatic grenade launchers, 73 mm antitank recoilless rifles, 82 mm mortars, antiaircraft guns, armoured personnel carriers and armoured fighting vehicles. The same sources said that Ukrainian forces broke the ceasefire 151 times over the past week. The Ukrainian army fired 170 rounds from 82 mm and 120 mm mortars and employed armoured fighting vehicles on the same period. No Ukrainian violations of the ceasefire were reported by the self-proclaimed Luhansk People's Republic. The press-centre of the JFO reported in the evening that from 7:00 am to 6:00 pm pro-Russian military had opened fire on positions of Ukrainian troops on 10 occasions, one Ukrainian serviceman was wounded as a result. By the end of the day total 16 ceasefire violations were registered. Pro-Russian officials from Donetsk city told the press that Ukrainian forces had broken the ceasefire on several occasions by evening. Spartak, Yasynuvata, Yakovliivka, Volvo Center, Staromykhailivka, Oleksandrivka, Kruta Balka and Zhabicheve, in the surroundings of Donetsk city, Zaitseve, Gagarin mining complex and Izotove mining complex, in the area of Horlivka, and,in the region of Mariupol, Sakhanka, Nova Tavrya and Pikuzy, came under hostile fire. In the main incidents, 82 mm mortar rounds landed in Nova Tavrya, while BMP-2 armoured vehicles from Krasnohorivka and Dzerzhinsky engaged pro-Russian redoubts at Volvo Center and Gagarin mining complex. Yakovliivka received fire from 73 mm antitank recoilless rifles. The spokesman of the Ukrainian operational headquarters reported in the morning, that pro-Russian troops had opened fire on 16 occasions on Ukrainian positions the previous day (including on 15 occasions in Donetsk region and once in Luhansk region); the fire was returned almost always. By noon of 20 October two ceasefire violations were registered with no casualties on the Ukrainian side. The spokesman of the Ministry of Defence confirmed at noon that one Ukrainian serviceman was wounded in the Donbass region on 19 October. Pro-Russian sources at Donetsk city reported 24 Ukrainian violations of the ceasefire in 15 locations using small arms, heavy machine guns, automatic grenade launchers, 73 mm antitank recoilless rifles, 82 mm mortars, armoured personnel carriers and armoured fighting vehicles. Authorities from the self-proclaimed Luhansk People's Republic recorded two Ukrainian violations of the truce within the republic boundaries. Ukrainian forces shelled Sentianivka with 82 mm mortars and Kalynivka with 73 mm antitank recoilless rifles. According to the information provided by the press-centre of the JFO in the evening, from 7:00 am to 6:00 pm pro-Russian military had opened fire on positions of Ukrainian troops on 7 occasions, as a result, one Ukrainian soldier was wounded. By the end of the day total 17 ceasefire violations were registered, another Ukrainian serviceman was wounded as a result. Pro-Russian officials at Donetsk city reported several Ukrainian violations of the ceasefire throughout the day. The Ukrainian military launched attacks on Spartak, Yasynuvata, Vasilyevka, Dokuchaievsk and Donetsk airport, in the outskirts of Donetsk city, Izotove mining complex, in the area of Horlivka, and, in the region of Mariupol, Sakhanka and Uzhivka. In the main incidents, heavy shelling was reorted at Sakhanka and Uzhivka, which were hit by 82 mm mortar barrages; 82 mm mortar rounds also landed in Izotove and Spartak. BMP-1 armoured vehicles from Vodiane engaged pro-Russian positions at Uzhivka. BMP-2 armoured vehicles from Shumy and Kamianka riddled pro-Russian redoubts at Izotove and Vasilyevka, respectively. Vasilyevka was left without electrical power after a number of powerlines were hit. According to the information provided by the spokesman of the Ukrainian operational headquarters in the morning, pro-Russian troops had opened fire on 16 occasions on Ukrainian positions the previous day (including on 16 occasions in Donetsk region and once in Luhansk region); the fire was returned on 9 occasions. By morning of 21 October (as of 9:00 am) one ceasefire violation was registered with no casualties on the Ukrainian side. The spokesman of the Ministry of Defence confirmed at noon that two Ukrainian servicemen were wounded in the Donbass region on 20 October. Pro-Russian authorities at Donetsk city reported 23 Ukrainian violations of the ceasefire in 11 locations using small arms, heavy machine guns, snipers, automatic grenade launchers, 73 mm antitank recoilless rifles, 82 mm mortars, 120 mm mortars, armoured personnel carriers and armoured fighting vehicles. No Ukrainian violations of the truce were reported within the borders of the self-proclaimed Luhansk People's Republic. The press-centre of the JFO reported in the evening that from 7:00 am to 6:00 pm pro-Russian military had opened fire on positions of Ukrainian troops on 8 occasions, as a result, three Ukrainian servicemen were wounded; the fire was returned on several occasions. By the end of the day total 19 ceasefire violations were registered. Pro-Russian officials at Donetsk city told the press that Ukrainian forces broke the ceasefire on several occasions by evening. Yasynuvata, Verkhnyotoretske, Kruta Balka, Trudivske, Lozove, Spartak, Luhanske, Kashtanove and Mineralne, in the environs of Donetsk city, Zaitseve, Dolomitne, Izotove mining complex, Shyroka Balka, Gagarin mining complex, Holmivsky, Mayorsk checkpoint and Ozeryanivka, in the area of Horlivka, and, in the region of Mariupol, Sakhanka, Uzhivka, Pikuzy and Novolaspa, came under hostile fire. In the main incidents, Ukrainian troops at Sakhanka received 120 mm mortar fire, while 82 mm mortar rounds hit Uzhivka. BMP-1 armoured vehicles from Troitske engaged pro-Russian redoubts at Ozeryanivka. BMP-2 vehicles from Novoluhanske, Novhorodske and Avdiivka fired their 30 mm cannons at pro-Russian positions around Dolomitne, Shyroka Balka and Mineralne, respectively. ZU-23-2 antiaircraft guns were used to pound the pro-Russian strongholds of Kashtanove, Yasynuvata and Shyroka Balka. Gagarin mining complex was fired at from 73 mm antitank recoilless rifles. The spokesman of the Ukrainian operational headquarters reported in the morning, that pro-Russian troops had opened fire on 19 occasions on Ukrainian positions the previous day (including on 15 occasions in Donetsk region and on 4 occasions in Luhansk region); the fire was returned on several occasions. By morning of 22 October (as of 11:00 am) two ceasefire violations were registered with no casualties on the Ukrainian side. The spokesman of the Ministry of Defence confirmed at noon that three Ukrainian servicemen were wounded in action in the Donbass region on 21 October. Pro-Russian authorities at Donetsk city reported 30 Ukrainian violations of the ceasefire in 22 locations using small arms, heavy machine guns, snipers, automatic grenade launchers, 73 mm antitank recoilless rifles, 82 mm mortars, 120 mm mortars, antiaircraft guns, armoured personnel carriers and armoured fighting vehicles. Four pro-Russian soldier were killed in action, three of them by shelling in the area of Uzhivka and another one by sniper fire in Pikuzy. Officials from the self-proclaimed Luhansk People's Republic recorded six Ukrainian violations of the truce within the republic boundaries. Ukrainian forces employed small arms, heavy machine guns, automatic grenade launchers, 73 mm antitank recoilless rifles, 82 mm mortars, 120 mm mortars and BMP-1 armoured vehicles to engage pro-Russian forces at Vesela Hora, Mariivka, Sentianivka, Sokilnyky and Donetskyi. According to the information provided by the press-centre of the JFO in the evening, from 7:00 am to 6:00 pm pro-Russian military had opened fire on positions of Ukrainian troops on 5 occasions. By the end of the day total 12 ceasefire violations were registered with no casualties on the Ukrainian side. A series of Ukrainian violations of the ceasefire were reported by pro-Russian officials at Donetsk city by evening. Spartak, Trudivske, VolvoCenter, Kruta Balka, Oleksandrivka, Staromykhailivka, Yasynuvata and Yasne, in the surroundings of Donetsk city, Zaitseve, Dolomitne and Gagarin mining complex in the area of Horlivka, and, in the region of Mariupol, Sakhanka and Pikuzy, came under attack. The majority of incidents involved the use of infantry weapons and automatic grenade launchers. Volvo Center was targeted by 73 mm antitank recoilless rifles, while BMP-2 armoured vehicles from Novoluhanske launched an attack on pro-Russian positions at Dolomitne. According to the information provided by the spokesman of the Ukrainian operational headquarters in the morning, pro-Russian troops had opened fire on 12 occasions on Ukrainian positions the previous day (including on 9 occasions in Donetsk region and on 3 occasions in Luhansk region); the fire was returned on 5 occasions. By morning of 23 October (as of 11:00 am) no ceasefire violations were registered. The spokesman of the Ministry of Defence reported at noon no casualties in the Donbass region on 22 October. Pro-Russian officials at Donetsk city reported 22 Ukrainian violations of the ceasefire in 12 locations using small arms, heavy machine guns, snipers, automatic grenade launchers, 73 mm antitank recoilless rifles, armoured personnel carriers and armoured fighting vehicles. According to local sources, the Ukrainian military broke the ceasefire two times within the borders of the self-styled Luhansk People's Republic. The Ukrainian military employed small arms, automatic grenade launchers, rocket launchers, 73 mm antitank recoilless rifles, 120 mm mortars to attack pro-Russian positions at Vesela Hora and Lozove. The press-centre of the JFO reported in the evening that from 7:00 am to 6:00 pm pro-Russian military had opened fire on positions of Ukrainian troops on 4 occasions, as a result, one Ukrainian serviceman was killed; the fire was returned on all occasions. By the end of the day total 9 ceasefire violations were registered. Pro-Russian authorities reported several Ukrainian violations of the ceasefire throughout the day. Ukrainian forces opened fire on Spartak, Dokuchaievsk, Trudivske, Oleksandrivka, Vasilyevka, Yasynuvata, Yakovliivka, Donetsk airport and Volvo Center, in the outskirts of Donetsk city, Zaitseve and Dolomitne, in the area of Horlivka, and, in the region of Mariupol, Pikuzy, Sakhanka and Uzhivka. In the main incidents, 82 mm and 120 mm mortar rounds hit Uzhivka, while Yakovliivka and Sakhanka came under 82 mm mortar fire. BMP-2 armoured vehicles from Avdiivka attacked Yakovliivka, while Trudivske was shelled with 73 mm antitank recoilless rifles. The spokesman of the Ukrainian operational headquarters reported in the morning, that pro-Russian troops had opened fire on 9 occasions on Ukrainian positions the previous day (including on 8 occasions in Donetsk region and once in Luhansk region); the fire was returned on several occasions. By morning of 24 October (as of 11:00 am) two ceasefire violations were registered with no casualties on the Ukrainian side. The spokesman of the Ministry of Defence reported at noon that one Ukrainian serviceman (born in 1984) was killed in action in the Donbass region on 23 October. Pro-Russian authorities at Donetsk city reported 19 Ukrainian violations of the ceasefire in 12 locations using small arms, heavy machine guns, snipers, automatic grenade launchers, 73 mm antitank recoilless rifles, 82 mm mortars, 120 mm mortars, armoured personnel carriers and armoured fighting vehicles. Sources from the self-proclaimed Luhansk People's Republic recorded four Ukrainian violations of the truce within the republic boundaries. The Ukrainian military used 82 mm mortars, BMP-1 and BMP-2 armoured vehicles from Novotoshkivke and Troitske to attack pro-Russian positions at Zholobok, Donetskyi and Kalynove. According to the information provided by the press-centre of the JFO in the evening, from 7:00 am to 6:00 pm pro-Russian military had opened fire on positions of Ukrainian troops on 7 occasions, as a result, one Ukrainian soldier was wounded. By the end of the day total 14 ceasefire violations were registered. Pro-Russian officials told the press that Ukrainian forces had launched a series of attacks on pro-Russian troops by evening. Oleksandrivka, Petrovsky, Kruta Balka and Yasynuvata, in the environs of Donetsk city, Zaitseve, Holmivsky, Shyroka Balka, Dolomitne and Gagarin mining complex, in the area of Horlivka, and, in the region of Mariupol, Sakhanka, Uzhivka and Nova Tavrya, came under hostile fire. In the main incidents, heavy shelling was reported in the region of Mariupol, where Sakhanka and Nova Tavrya were struck by 122 mm artillery volleys; Sakhanka also became the target of 82 mm and 120 mm mortar fire. Ukrainian tanks from Talakivka engaged pro-Russian redoubts at Uzhivka. Uzhivka was likewise hit by 82 mm mortar barrages. BMP-1 armoured vehicles from Shyrokyne and Marinka opened fire on pro-Russian positions at Sakhanka and Oleksandrivka, respectively. BMP-2 armoured vehicles from Travneve attacked Holmivsky, while pro-Russian troops at Yasynuvata were harassed with ZU-23-2 antiaircraft cannon fire from Avdiivka. Later in the evening, BMP-2 armoured vehicles from Krasnohorivka riddled pro-Russian positions at Staromykhailivka with 30 mm gunfire. Gagarin mining complex received fire from 73 mm antitank recoilless rifles. According to the information provided by the spokesman of the Ukrainian operational headquarters in the morning, pro-Russian troops had opened fire on 14 occasions on Ukrainian positions the previous day (including on 9 occasions in Donetsk region and on 5 occasions in Luhansk region); the fire was returned on 10 occasions. By morning of 25 October (as of 11:00 am) three ceasefire violations were registered, as a result, one Ukrainian serviceman was wounded. The spokesman of the Ministry of Defence confirmed at noon that one Ukrainian serviceman was wounded in the Donbass region on 24 October. Pro-Russian sources at Donetsk city reported 21 Ukrainian violations of the ceasefire in 13 locations using small arms, heavy machine guns, automatic grenade launchers, 73 mm antitank recoilless rifles, 82 mm mortars, 120 mm mortars, antiaircraft guns, armoured personnel carriers, armoured fighting vehicles and tanks. Officials from the self-proclaimed Luhansk People's Republic recorded three Ukrainian violations of the truce within the republic boundaries. The Ukrainian miliitary used automatic grenade launchers, antitank rockets, 82 mm and 120 mm mortars to attack pro-Russian forces at Holubovske, Dolhe and Lozove. The press-centre of the JFO reported in the evening that from 7:00 am to 6:00 pm pro-Russian military had opened fire on positions of Ukrainian troops on 5 occasions, as a result, one Ukrainian soldier was wounded. By the end of the day total 17 ceasefire violations were registered Pro-Russian authorities at Donetsk city said that Ukrainian forces broke the ceasefire on several occasions by evening. Trudivske, Staromykhailivka, Oleksandrivka, Spartak, Kruta Balka, Volvo Center and Donetsk airport, in the surroundings of Donetsk city, Zaitseve and Gagarin mining complex, in the outskirts of Horlivka, and, in the region of Mariupol, Sakhanka, Pikuzy and Novoshyrokivske, came under hostile fire. In the main incidents, Sakhanka and Volvo Center came under 82 mm mortar fire. BMP-1 armoured fighting vehicles from Pyshchevik and Shyrokyne engaged pro-Russian redoubts at Novoshyrokivske and Sakhanka, respectively. 73 mm antitank recoilless rifles were fired at Spartak, Volvo Center, Pikuzy and Gagarin mining complex. The spokesman of the Ukrainian operational headquarters reported in the morning, that pro-Russian troops had opened fire on 17 occasions on Ukrainian positions the previous day (including on 14 occasions in Donetsk region and on 3 occasions in Luhansk region); the fire was returned on 14 occasions. By morning of 26 October (as of 11:00 am) one ceasefire violation was registered with no casualties on the Ukrainian side; the fire was not returned. The spokesman of the Ministry of Defence confirmed at noon that one Ukrainian serviceman was wounded in the Donbass region on 25 October. Pro-Russian authorities at Donetsk city reported 19 Ukrainian violations of the ceasefire in ten locations using small arms, heavy machine guns, grenade launchers, 73 mm antitank recoilless rifles, 82 mm mortars, armoured personnel carriers and armoured fighting vehicles. Eduard Basurin, deputy minister of defence of the Donetsk People's Republic and military spokesman, said that Ukrainian forces had broken the ceasefire 158 times over the last week. On the same period, the Ukrainian army fired 13 shells from 122 mm self-propelled artillery, five rounds from tanks, 83 rounds from 82 mm and 120 mm mortars. Ukrainian forces also used armoured fighting vehicles. Four pro-Russian soldiers were killed in action. Officials from the self-proclaimed Luhansk People's Republic recorded six Ukrainian violations of the truce within the republic boundaries. Ukrainian forces employed small arms, automatic grenade launchers, 73 mm antitank recoilless rifles, 82 mm mortars, 120 mm mortars and BMP-1 armoured vehicles to engage pro-Russian forces at Sokilnyky, Donetskyi, Lozove, Lohvynove and Kalynove. According to the information provided by the press-centre of the JFO in the evening, pro-Russian military had opened fire on positions of Ukrainian troops on 3 occasions, one Ukrainian soldier was wounded as a result. By the end of the day total 8 ceasefire violations were registered, another Ukrainian serviceman was wounded. Pro-Russian sources at Donetsk city reported several Ukrainian violations of the ceasefire by evening. Yasynuvata, Dokuchaievsk, Staromykhailivka, Donetsk airport, Mineralne, Trudivske, Vasilyevka and Spartak, in the environs of Donetsk city, Zaitseve and Gagarin mining complex, in the area of Horlivka, and, in the region of Mariupol, Sakhanka and Uzhivka, cameunder hostile fire. In the main incidents, 120 mm mortar rounds landed in Gagarin, Yasynuvata and Spartak, while Uzhivka came under 82 mm mortar fire. BMP-1 armoured vehicles from Avdiivka launched a sustained attack on pro-Russian redoubts at Yasynuvata supported by automatic grenade launchers. BMP-1 armoured vehicles from Novohnativka also fired on pro-Russian forces at Dokuchaievsk. BMP-2 armoured vehicles attacked Zaitseve supported by ZU-23-2 antiaircraft guns. BMP-2 armoured vehicles from Krasnohorivka also engaged pro-Russian positions at Staromykhailivka. Spartak became the target of 73 mm antitank recoilless rifles. According to the information provided by the spokesman of the Ukrainian operational headquarters in the morning, pro-Russian troops had opened fire on 8 occasions on Ukrainian positions the previous day (including on 7 occasions in Donetsk region and once in Luhansk region); the fire was returned on 6 occasions. By morning of 27 October (as of noon) three ceasefire violations were registered with no casualties on the Ukrainian side. An OSCE operated drone was shot down near the Russian-Ukrainian border early in the morning. The spokesman of the Ministry of Defence confirmed at noon that two Ukrainian servicemen were wounded in the Donbass region on 26 October. Pro-Russian authorities at Donetsk city reported 25 Ukrainian violations of the ceasefire in 13 locations using small arms, heavy machine guns, snipers, automatic grenade launchers, 73 mm antitank recoilless rifles, 82 mm mortars, 120 mm mortars, antiaircraft guns, armoured personnel carriers and armoured fighting vehicles. According to local sources, the Ukrainian military broke the ceasefire once within the borders of the self-proclaimed Luhansk People's Republic, when Ukrainian BMP-1 vehicles opened fire on Kalynivka supported by automatic grenade launchers. The press-centre of the JFO reported in the evening that the pro-Russian military had opened fire on positions of Ukrainian troops on 4 occasions. By the end of the day total 15 ceasefire violations were registered, one Ukrainian soldier was killed as a result. Pro-Russian authorities from Donetsk city recorded a number of Ukrainian violations of the truce throughout the day. Ukrainian forces launched attacks on Oleksandrivka, Zhabicheve, Donetsk airport and Volvo Center, in the outskirts of Donetsk city, Gagarin mining complex, in the area of Horlivka, and, in the region of Mariupol, Uzhivka and Sakhanka. In the main incidents, Sakhanka and Uzhivka came under 82 mm and 120 mm mortar fire, while 82 mm mortar volleys landed in Volvo Center. BMP-1 armoured vehicles from Shyrokyne launched a sustained attack on Sakhanka. Volvo Center also received fire from BMP-1 and BMP-2 armoured vehicles based at Pisky. Nearby Zhabicheve became the target of 73 mm antitank recoilless rifles and ZU-23-2 antiaircraft guns. Pro-Russian troops shot down an armed drone over Pikuzy. The spokesman of the Ukrainian operational headquarters reported in the morning, that pro-Russian troops had opened fire on 15 occasions on Ukrainian positions the previous day (including on 11 occasions in Donetsk region and on 4 occasions in Luhansk region); the fire was returned on 9 occasions. By morning of 28 October one ceasefire violation was registered with no casualties on the Ukrainian side; the fire was not returned. The spokesman of the Ministry of Defence reported confirmed at noon that one Ukrainian serviceman was killed in the Donbass region on 27 October. Pro-Russian officials at Donetsk city reported 25 Ukrainian violations of the ceasefire in 13 locations using small arms, heavy machine guns, snipers, automatic grenade launchers, 73 mm antitank recoilless rifles, 82 mm mortars, 120 mm mortars, antiaircraft guns, armoured personnel carriers and armoured fighting vehicles. Authorities from the self-proclaimed Luhansk People's Republic recorded four Ukrainian violations of the truce within the republic boundaries. The Ukrainian military used small arms, heavy machine guns, antitank rocket launchers, 73 mm antitank rocket launchers, 82 mm mortars, 120 mm mortars and BMP-1 armoured vehicles to attack pro-Russian forces at Almazne, Kalynivka, Kalynove-Borshchevate, Lozove and Zholobok. According to the information provided by the press-centre of the JFO in the evening pro-Russian military had opened fire on positions of Ukrainian troops on 5 occasions. By the end of the day total 19 ceasefire violations were registered, one Ukrainian serviceman was wounded as a result. Pro-Russian sources at Donetsk city told the press that Ukrainian forces had broken the ceasefire several times by evening. Trudivske, Oleksandrivka, Kruta Balka, Volvo Center, Spartak, Olenivka and Staromykhailivka, in the environs of Donetsk city, Zaitseve and Gagarin mining complex, in the outskirts of Horlivka, and, in the region of Mariupol, Sakhanka, Pikuzy and Uzhivka, came under attack. In the main incidents, 120 mm mortar volleys landed in Sakhanka, Pikuzy and Olenivka, while 82 mm mortars were fired at Uzhivka, Trudivske, Sakhanka and Pikuzy. Ukrainian tanks from Shyrokyne launched a sustained attack on pro-Russian redoubts at Sakhanka, which also received fire from BMP-1 armoured vehicles. BMP-2 armoured vehicles from Pisky, meanwhile, raked pro-Russian positions at Volvo Center with 30 mm gunfire. According to the information provided by the spokesman of the Ukrainian operational headquarters in the morning, pro-Russian troops had opened fire on 19 occasions on Ukrainian positions the previous day (including on 18 occasions in Donetsk region and once in Luhansk region); the fire was returned on more than 10 occasions. By morning of 29 October (as of 11:00 am) three ceasefire violations were registered, exclusively in Donetsk region. The spokesman of the Ministry of Defence confirmed at noon that one Ukrainian serviceman was wounded in the Donbass region on 28 October. Pro-Russian officials at Donetsk city reported 22 Ukrainian violations of the ceasefire in 12 locations using small arms, heavy machine guns, automatic grenade launchers, 73 mm antitank recoilless rifles, 82 mm mortars, 120 mm mortars, armoured personnel carriers, armoured fighting vehicles and tanks. Local sources from the self-proclaimed Luhansk People's Republic recorded four Ukrainian violations of the truce within the republic boundaries. Ukrainian forces used 82 mm mortars, 120 mm mortars, BMP-1 armoured fighting vehicles and 122 mm self-propelled artillery to attack pro-Russian positions at Zholobok, Sokilnyky and Kalynove. The press-centre of the JFO reported in the evening that from 7:00 am to 6:00 pm pro-Russian military had opened fire on positions of Ukrainian troops on 7 occasions. By the end of the day total 20 ceasefire violations were registered, as a result, one Ukrainian soldier was wounded. A series of Ukrainian violations of the ceasefire were reported by pro-Russian authorities by evening. 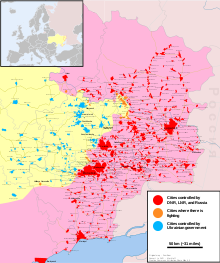 Kruta Balka, Spartak, Dokuchaievsk, Staromykhailivka, Vasylivka, Volvo Center and Zhabicheve, in the outskirts of Donetsk city, Zaitseve and Dolomitne, in the area of Horlivka, and, in the region of Mariupol, Sakhanka, Uzhivka and Pikuzy, came under hostile fire. Most incidents involved the use of infantry weapons and automatic grenade launchers. Staromykhailivka was repeatedly attacked by Ukrainian forces from Krasnohorivka using small arms, heavy machine guns, automatic grenade launchers, antitank rockets, and 73 mm antitank recoilles rifles. The village also became the target of a drone strike, when an unmanned aircraft dropped incendiary bombs on the pro-Russian stronghold. One civilian residence was set on fire. BMP-2 armoured vehicles from Novotroitske opened fire on pro-Russian redoubts at Dokuchaievsk. Volvo Center and Zaitseve were shelled with 73 mm antitank recoilless rifles. The spokesman of the Ukrainian operational headquarters reported in the morning, that pro-Russian troops had opened fire on 20 occasions on Ukrainian positions the previous day (including on 19 occasions in Donetsk region and once in Luhansk region); the fire was returned on 12 occasions. By morning of 30 October (as of 9:00 am) three ceasefire violations were registered with no casualties on the Ukrainian side. The spokesman of the Ministry of Defence at noon that one Ukrainian serviceman was wounded in the Donbass region on 29 October. Pro-Russian authorities at Donetsk city reported 23 Ukrainian violations of the ceasefire in 13 locations using small arms, heavy machine guns, snipers, automatic grenade launchers, 73 mm antitank recoilless rifles, 82 mm mortars, 120 mm mortars, armoured personnel carriers, armoured fighting vehicles and armed drones. According to local sources, the Ukrainian military broke the ceasefire twice within the borders of the self-proclaimed Luhansk People's Republic, when Ukrainian BMP-1 vehicles from Luhanske and Novotoshkivke engaged pro-Russian positions at Kalynivka and Holubovske, respectively. According to the information provided by the press-centre of the JFO in the evening, pro-Russian military had opened fire on positions of Ukrainian troops on 9 occasions, two Ukrainian soldiers were wounded as a result. By the end of the day total 21 ceasefire violations were registered. Several of Ukrainian violations of the ceasefire were reported by pro-Russian officials at Donetsk city by evening. Ukrainian forces opened fire on pro-Russian positions at Yasynuvata, Spartak, Staromykhailivka, Zhabicheve, Volvo Center, Vasylivka, Kruta Balka and Luhanske, in the environs of Donetsk city, Dolomitne, in the area of Horlivka, and, in the region of Mariupol, Sakhanka and Petrovske. In the main incidents, 120 mm mortars landed in Yasynuvata and Staromykhailivka; Yasynuvata and Vasylivka also came under 82 mm mortar fire. BMP-1 armoured vehicles from Avdiivka and Opytne engaged pro-Russian positions at Spartak. received fire from BMP-1 armoured vehicles based at Pisky. Antiaircraft guns were fired at Sakhanka and Kruta Balka. According to the information provided by the spokesman of the Ukrainian operational headquarters in the morning, pro-Russian troops had opened fire on 21 occasions on Ukrainian positions the previous day (including on 19 occasions in Donetsk region and twice in Luhansk region); the fire was returned on 9 occasions. By morning of 31 October (as of 9:00 am) three ceasefire violations were registered, with no casualties on the Ukrainian side. The spokesman of the Ministry of Defence confirmed at noon that two Ukrainian servicemen were wounded by shelling in the Donbass region on 30 October. Pro-Russian authorities at Donetsk city reported 19 Ukrainian violations of the ceasefire in 14 locations using small arms, heavy machine guns, snipers, automatic grenade launchers, 73 mm antitank recoilless rifles, 82 mm mortars, 120 mm mortars, armoured personnel carriers and armoured fighting vehicles. Officials from the self-proclaimed Luhansk People's Republic recorded four Ukrainian violations of the truce within the republic boundaries. Ukrainian forces employed heavy machine guns, automatic grenade launchers, rocket launchers, 73 mm antitank recoilless rifles and 82 mm mortars to engage pro-Russian forces at Lohvynove, Lozove, Donetskyi and Zholobok. The press-centre of the JFO reported in the evening that pro-Russian military had opened fire on positions of Ukrainian troops on 13 occasions, as a result, two Ukrainian servicemen were wounded. By the end of the day total 24 ceasefire violations were registered. Pro-Russian authorities from Donetsk city recorded a number of Ukrainian violations of the truce throughout the day. Spartak, Volvo Center, Staromykhailivka, Oleksandrivka, Trudivske and Kruta Ballka, in the outskirts of Donetsk city, Zaitseve, Gagarin mining complex and Dolomitne, in the area of Horlivka, and, in the region of Mariupol, Sakhanka, Pikuzy, Uzhivka and Novoshyrokivske, came under hostile fire. Most incidents involved the use of infantry weapons and automatic grenade launchers. Spartak was hit by 82 mm mortars. Volvo Center and Spartak became the target of 73 mm antitank recoilless rifles. ^ "Зведення щодо обстановки в районі проведення операції Об'єднаних сил станом на 07:00 1 жовтня 2018 року" (in Ukrainian). MoD. 1 October 2018. Retrieved 1 October 2018. ^ "Militants launched 28 attacks on Ukrainian troops in Donbas in last day". Ukrinform. 1 October 2018. Retrieved 1 October 2018. ^ a b "Брифінг речника Міністерства оборони України щодо обстановки в районі проведення операції Об'єднаних сил" (in Ukrainian). MoD. 1 October 2018. Retrieved 1 October 2018. ^ "ВСУ за сутки обстреляли 14 населенных пунктов - СЦКК". Официальный сайт ДНР. 1 October 2018. Retrieved 1 October 2018. ^ 24, Донецк. "Оперативная сводка за сутки с 30 на 01 октября от НМ ЛНР". Донецк 24 (in Russian). Retrieved 1 October 2018. ^ "Зведення щодо обстановки у районі проведення операції Об'єднаних сил станом на 18:00 1 жовтня 2018 року" (in Ukrainian). MoD. 1 October 2018. Retrieved 1 October 2018. ^ a b "Зведення щодо обстановки в районі проведення операції Об'єднаних сил станом на 07:00 02 жовтня 2018 року" (in Ukrainian). MoD. 2 October 2018. Retrieved 2 October 2018. ^ "Militants launched 21 attacks on Ukrainian troops in Donbas in last day". Ukrinform. 2 October 2018. Retrieved 2 October 2018. ^ "Видео крушения украинского беспилотника". News Front - Новостной Фронт. Новости Мира России Украины (in Russian). Retrieved 2 October 2018. ^ a b c d "Брифінг речника Міністерства оборони України щодо обстановки в районі проведення операції Об'єднаних сил" (in Ukrainian). MoD. 2 October 2018. Retrieved 2 October 2018. ^ "ВСУ обстреляли аэропорт, Ясиноватую и 11 поселков - СЦКК". 2 October 2018. Retrieved 2 October 2018. ^ 24, Донецк. "Оперативная сводка за сутки с 01 на 02 октября от НМ ЛНР". Донецк 24 (in Russian). Retrieved 2 October 2018. ^ "Зведення щодо обстановки у районі проведення операції Об'єднаних сил станом на 18:00 2 жовтня 2018 року" (in Ukrainian). MoD. 2 October 2018. Retrieved 2 October 2018. ^ a b "Зведення щодо обстановки у районі проведення операції Об'єднаних сил станом на 07:00 3 жовтня 2018 року" (in Ukrainian). MoD. 3 October 2018. Retrieved 3 October 2018. ^ "Militants launched 34 attacks on Ukrainian troops in Donbas in last day". Ukrinform. 3 October 2018. Retrieved 3 October 2018. ^ "ВСУ за сутки обстреляли 11 населенных пунктов - СЦКК". 3 October 2018. Retrieved 3 October 2018. ^ 24, Донецк. "Оперативная сводка за сутки с 02 на 03 октября от НМ ЛНР". Донецк 24 (in Russian). Retrieved 4 October 2018. ^ "Зведення щодо обстановки у районі проведення операції Об'єднаних сил станом на 18:00 3 жовтня 2018 року" (in Ukrainian). MoD. 3 October 2018. Retrieved 3 October 2018. ^ a b "Зведення щодо обстановки у районі проведення операції Об'єднаних сил станом на 07:00 4 жовтня 2018 року" (in Ukrainian). MoD. 4 October 2018. Retrieved 4 October 2018. ^ "Militants launched 21 attacks on Ukrainian troops in Donbas in last day". Ukrinform. 4 October 2018. Retrieved 4 October 2018. ^ "ВСУ двадцать пять раз нарушили режим прекращения огня - СЦКК". Официальный сайт ДНР. 4 October 2018. Retrieved 4 October 2018. ^ 24, Донецк. "Оперативная сводка за сутки с 3 на 4 октября от НМ ЛНР". Донецк 24 (in Russian). Retrieved 4 October 2018. ^ "Операція об'єднаних сил / Joint forces operation | Зведення станом на 18:00 4 жовтня 2018 року" (in Ukrainian). Press-centre of the JFO HQ. 4 October 2018. Retrieved 4 October 2018. ^ "Зведення щодо обстановки у районі проведення операції Об'єднаних сил станом на 18:00 4 жовтня 2018 року" (in Ukrainian). MoD. 4 October 2018. Retrieved 4 October 2018. ^ a b "Зведення щодо обстановки в районі проведення операції Об'єднаних сил станом на 07:00 5 жовтня 2018 року" (in Ukrainian). MoD. 5 October 2018. Retrieved 5 October 2018. ^ "Militants launched 20 attacks on Ukrainian troops in Donbas in last day". Ukrinform. 5 October 2018. Retrieved 5 October 2018. ^ 24, Донецк. "Сводка нарушений режима прекращения огня с 4 по 5 октября - СЦКК". Донецк 24 (in Russian). Retrieved 5 October 2018. ^ 24, Донецк. "Оперативная сводка за сутки с 3 на 4 октября от НМ ЛНР". Донецк 24 (in Russian). Retrieved 5 October 2018. ^ "Зведення щодо обстановки у районі проведення операції Об'єднаних сил станом на 18:00 5 жовтня 2018 року" (in Ukrainian). MoD. 5 October 2018. Retrieved 5 October 2018. ^ a b "Зведення щодо обстановки в районі проведення операції Об'єднаних сил станом на 07:00 06 жовтня 2018 року" (in Ukrainian). MoD. 6 October 2018. Retrieved 6 October 2018. ^ a b c d "Брифінг речника Міністерства оборони України щодо обстановки в районі проведення операції Об'єднаних сил" (in Ukrainian). MoD. 6 October 2018. Retrieved 6 October 2018. ^ "ВСУ за сутки двадцать шесть раз обстреляли ДНР - СЦКК". Официальный сайт ДНР. 6 October 2018. Retrieved 6 October 2018. ^ 24, Донецк. "Оперативная сводка за сутки с 5 на 6 октября от НМ ЛНР". Донецк 24 (in Russian). Retrieved 7 October 2018. ^ "Зведення щодо обстановки у районі проведення операції Об'єднаних сил станом на 18:00 6 жовтня 2018 року" (in Ukrainian). MoD. 6 October 2018. Retrieved 6 October 2018. ^ a b "Зведення щодо обстановки в районі проведення операції Об'єднаних сил станом на 07:00 7 жовтня 2018 року" (in Ukrainian). MoD. 7 October 2018. Retrieved 7 October 2018. ^ "ВСУ обстреливали Донецк, Горловку и прифронтовые поселки - СЦКК". Официальный сайт ДНР. 7 October 2018. Retrieved 7 October 2018. ^ "Украинские боевики обстреляли районы 12 населенных пунктов Республики, погиб один защитник ДНР – Даниил Безсонов". 7 October 2018. Retrieved 7 October 2018. ^ 24, Донецк. "Оперативная сводка за сутки с 6 на 7 октября от НМ ЛНР". Донецк 24 (in Russian). Retrieved 7 October 2018. ^ "Зведення щодо обстановки у районі проведення операції Об'єднаних сил станом на 18:00 7 жовтня 2018 року" (in Ukrainian). MoD. 7 October 2018. Retrieved 7 October 2018. ^ a b "Зведення щодо обстановки в районі проведення операції Об'єднаних сил станом на 07:00 08 жовтня 2018 року" (in Ukrainian). MoD. 8 October 2018. Retrieved 8 October 2018. ^ "Militants launched 27 attacks on Ukrainian troops in Donbas in last day". Ukrinform. 8 October 2018. Retrieved 8 October 2018. ^ "ВСУ двадцать пять раз нарушили режим прекращения огня, нарушено энергоснабжение- СЦКК". Официальный сайт ДНР. 8 October 2018. ^ 24, Донецк. "Оперативная сводка за сутки с 7 на 8 октября от НМ ЛНР". Донецк 24 (in Russian). Retrieved 8 October 2018. ^ "Зведення щодо обстановки у районі проведення операції Об'єднаних сил станом на 18:00 8 жовтня 2018 року" (in Ukrainian). MoD. 8 October 2018. Retrieved 8 October 2018. ^ a b "Зведення щодо обстановки в районі проведення операції Об'єднаних сил станом на 07:00 9 жовтня 2018 року" (in Ukrainian). MoD. 9 October 2018. Retrieved 9 October 2018. ^ "Militants launched 36 attacks on Ukrainian troops in Donbas in last day". Ukrinform. 9 October 2018. Retrieved 9 October 2018. ^ "Thousands Evacuated As Blasts, Blaze Rip Through Ukraine Ammo Dump". REF/RL. 9 October 2018. Retrieved 9 October 2018. ^ "В Коминтерново и Донецке обстрелом ВСУ повреждены дома и школа - СЦКК". Официальный сайт ДНР. 9 October 2018. Retrieved 9 October 2018. ^ 24, Донецк. "Оперативная сводка за сутки с 8 на 9 октября от НМ ЛНР". Донецк 24 (in Russian). Retrieved 9 October 2018. ^ "Операція об'єднаних сил / Joint forces operation | Зведення станом на 18:00 9 жовтня 2018 року" (in Ukrainian). Press-centre of the JFO HQ. 9 October 2018. Retrieved 9 October 2018. ^ "Зведення щодо обстановки у районі проведення операції Об'єднаних сил станом на 18:00 9 жовтня 2018 року" (in Ukrainian). MoD. 9 October 2018. Retrieved 9 October 2018. ^ "Сегодня в зоне ООС один боец ранен, зафиксировано 16 вражеских обстрелов" (in Russian). Information Resistance. 9 October 2018. Retrieved 9 October 2018. ^ a b "Зведення щодо обстановки в районі проведення операції Об'єднаних сил станом на 07:00 10 жовтня 2018 року" (in Ukrainian). MoD. 10 October 2018. Retrieved 10 October 2018. ^ "Militants launched 39 attacks on Ukrainian troops in Donbas in last day". Ukrinform. 10 October 2018. Retrieved 10 October 2018. ^ 24, Донецк. "Сводка нарушений режима прекращения огня с 9 по 10 октября - СЦКК". Донецк 24 (in Russian). Retrieved 10 October 2018. ^ 24, Донецк. "Оперативная сводка за сутки с 9 на 10 октября от НМ ЛНР". Донецк 24 (in Russian). Retrieved 10 October 2018. ^ "Зведення щодо обстановки у районі проведення операції Об'єднаних сил станом на 18:00 10 жовтня 2018 року" (in Ukrainian). MoD. 10 October 2018. Retrieved 10 October 2018. ^ a b c "Зведення щодо обстановки в районі проведення операції Об'єднаних сил станом на 07:00 11 жовтня 2018 року" (in Ukrainian). MoD. 11 October 2018. Retrieved 11 October 2018. ^ "Militants launched 28 attacks on Ukrainian troops in Donbas in last day". Ukrinform. 11 October 2018. Retrieved 11 October 2018. ^ 24, Донецк. "Зафиксированы обстрелы со стороны ВСУ по Спартаку и Старомихайловке". Донецк 24 (in Russian). Retrieved 11 October 2018. ^ "Народная милиция ДНР сбила украинский БПЛА, который вел корректировку огня по окраинам Донецка | ДАН". dan-news.info (in Russian). Retrieved 30 October 2018. ^ "Four Ukrainian Soldiers Killed In Country's East". RFE/RL. 11 October 2018. Retrieved 11 October 2018. ^ "ВСУ двадцать два раза нарушили режим прекращения огня, повреждены жилые дома - СЦКК / The AFU twenty-two times violated the cease-fire, dwelling houses are damaged – JCCC". 11 October 2018. Retrieved 11 October 2018. ^ 24, Донецк. "Оперативная сводка за сутки с 10 на 11 октября от НМ ЛНР". Донецк 24 (in Russian). Retrieved 11 October 2018. ^ "Зведення щодо обстановки у районі проведення операції Об'єднаних сил станом на 18:00 11 жовтня 2018 року" (in Ukrainian). MoD. 11 October 2018. Retrieved 11 October 2018. ^ a b "Зведення щодо обстановки в районі проведення операції Об'єднаних сил станом на 07:00 12 жовтня 2018 року" (in Ukrainian). MoD. 12 October 2018. Retrieved 12 October 2018. ^ "Militants launched 27 attacks on Ukrainian troops in Donbas in last day". Ukrinform. 12 October 2018. Retrieved 12 October 2018. ^ "Силы НМ ДНР за неделю уничтожили в небе над Коминтерново и Саханкой два ударных беспилотника ВСУ | ДАН". dan-news.info (in Russian). Retrieved 30 October 2018. ^ a b c d "Брифінг речника Міністерства оборони України щодо обстановки в районі проведення операції Об'єднаних сил" (in Ukrainian). MoD. 12 October 2018. Retrieved 12 October 2018. ^ 24, Донецк. "Сводка нарушений режима прекращения огня с 11 по 12 октября - СЦКК". Донецк 24 (in Russian). Retrieved 12 October 2018. ^ "За неделю обстрелами ВСУ повреждено 15 домостроений, ранен мирный житель, один защитник ДНР погиб – Даниил Безсонов (видео)". 12 October 2018. Retrieved 27 October 2018. ^ 24, Донецк. "Оперативная сводка за сутки с 11 на 12 октября от НМ ЛНР". Донецк 24 (in Russian). Retrieved 12 October 2018. ^ "Зведення щодо обстановки у районі проведення операції Об'єднаних сил станом на 18:00 12 жовтня 2018 року" (in Ukrainian). MoD. 12 October 2018. Retrieved 12 October 2018. ^ a b "Зведення щодо обстановки в районі проведення операції Об'єднаних сил станом на 07:00 13 жовтня 2018 року" (in Ukrainian). MoD. 13 October 2018. Retrieved 13 October 2018. ^ "Militants launched 26 attacks on Ukrainian troops in Donbas in last day". Ukrinform. 13 October 2018. Retrieved 13 October 2018. ^ "ВСУ двадцать два раза нарушили режим прекращения огня, повреждены жилые дома - СЦКК". Официальный сайт ДНР. 13 October 2018. Retrieved 13 October 2018. ^ "Карта обстрелов 13 октября 2018. Обстановка на линии соприкосновения за сутки — НМ ЛНР". News Front - Новостной Фронт. Новости Мира России Украины (in Russian). Retrieved 13 October 2018. ^ "Зведення щодо обстановки у районі проведення операції Об'єднаних сил станом на 18:00 13 жовтня 2018 року" (in Ukrainian). MoD. 13 October 2018. Retrieved 13 October 2018. ^ a b "Зведення щодо обстановки в районі проведення операції Об'єднаних сил станом на 07:00 14 жовтня 2018 року" (in Ukrainian). MoD. 14 October 2018. Retrieved 14 October 2018. ^ "ВСУ обстреляли тринадцать населенных пунктов - СЦКК". Официальный сайт ДНР. 14 October 2018. Retrieved 14 October 2018. ^ "Очередная кровь Донбасса: кто ответит за убийство матери и дочки?". News Front - Новостной Фронт. Новости Мира России Украины (in Russian). Retrieved 13 October 2018. ^ "Результаты агрессии карателей: четыре обстрела, погибли два человека". News Front - Новостной Фронт. Новости Мира России Украины (in Russian). Retrieved 14 October 2018. ^ "Зведення щодо обстановки у районі проведення операції Об'єднаних сил станом на 18:00 14 жовтня 2018 року" (in Ukrainian). MoD. 14 October 2018. Retrieved 14 October 2018. ^ a b "Зведення щодо обстановки в районі проведення операції Об'єднаних сил станом на 07:00 15 жовтня 2018 року" (in Ukrainian). MoD. 15 October 2018. Retrieved 15 October 2018. ^ "Militants launched 23 attacks on Ukrainian troops in Donbas in last day". Ukrinform. 15 October 2018. Retrieved 15 October 2018. ^ "В зоне обстрела со стороны ВСУ оказались Горловка, Ясиноватая, Спартак, Донецк, Докучаевск, Ленинское, Саханка - СЦКК". 15 October 2018. Retrieved 15 October 2018. ^ "В результате обстрела со стороны ВСУ погиб заключенный - СЦКК". 15 October 2018. Retrieved 15 October 2018. ^ 24, Донецк. "Оперативная сводка за сутки с 14 на 15 октября от НМ ЛНР". Донецк 24 (in Russian). Retrieved 15 October 2018. ^ "Зведення щодо обстановки у районі проведення операції Об'єднаних сил станом на 18:00 15 жовтня 2018 року" (in Ukrainian). MoD. 15 October 2018. Retrieved 15 October 2018. ^ a b "Зведення щодо обстановки в районі проведення операції Об'єднаних сил станом на 07:00 16 жовтня 2018 року". Официальный сайт ДНР (in Ukrainian). MoD. 16 October 2018. Retrieved 16 October 2018. ^ "Militants launched 37 attacks on Ukrainian troops in Donbas in last day". Официальный сайт ДНР. Ukrinform. 16 October 2018. Retrieved 16 October 2018. ^ "ВСУ обстреляли территорию Республики, применив 396 единиц боеприпасов - СЦКК". Официальный сайт ДНР. 16 October 2018. Retrieved 16 October 2018. ^ 24, Донецк. "Оперативная сводка за сутки с 15 на 16 октября от НМ ЛНР". Донецк 24 (in Russian). Retrieved 16 October 2018. ^ "Зведення щодо обстановки у районі проведення операції Об'єднаних сил станом на 18:00 16 жовтня 2018 року" (in Ukrainian). MoD. 16 October 2018. Retrieved 16 October 2018. ^ a b "Зведення щодо обстановки в районі проведення операції Об'єднаних сил станом на 07:00 17 жовтня 2018 року" (in Ukrainian). MoD. 17 October 2018. Retrieved 17 October 2018. ^ "Militants launched 19 attacks on Ukrainian troops in Donbas in last day". Ukrinform. 17 October 2018. Retrieved 17 October 2018. ^ "В Республике из-за обстрелов ВСУ повреждены дома и инфраструктура - СЦКК". 17 October 2018. Retrieved 17 October 2018. ^ 24, Донецк. "Оперативная сводка за сутки с 16 на 17 октября от НМ ЛНР". Донецк 24 (in Russian). Retrieved 17 October 2018. ^ "Зведення щодо обстановки у районі проведення операції Об'єднаних сил станом на 18:00 17 жовтня 2018 року" (in Ukrainian). MoD. 17 October 2018. Retrieved 17 October 2018. ^ a b c "Зведення щодо обстановки в районі проведення операції Об'єднаних сил станом на 07:00 18 жовтня 2018 року" (in Ukrainian). MoD. 18 October 2018. Retrieved 18 October 2018. ^ "Militants launched 17 attacks on Ukrainian troops in Donbas in last day". Ukrinform. 18 October 2018. Retrieved 18 October 2018. ^ "ВСУ двадцать шесть раз подвергли обстрелам территорию Республики, повреждены жилые дома - СЦКК". Официальный сайт ДНР. 18 October 2018. Retrieved 18 October 2018. ^ "В ЛНР Сокольники попали под минометный обстрел карателей". News Front - Новостной Фронт. Новости Мира России Украины (in Russian). Retrieved 19 October 2018. ^ "Зведення щодо обстановки у районі проведення операції Об'єднаних сил станом на 18:00 18 жовтня 2018 року" (in Ukrainian). MoD. 18 October 2018. Retrieved 18 October 2018. ^ a b "Зведення щодо обстановки в районі проведення операції Об'єднаних сил станом на 07:00 19 жовтня 2018 року" (in Ukrainian). MoD. 19 October 2018. Retrieved 19 October 2018. ^ "Militants launched 16 attacks on Ukrainian troops in Donbas in last day". Ukrinform. 19 October 2018. Retrieved 19 October 2018. ^ 24, Донецк. "Военнослужащие ЛНР и "афганцы" эвакуировали тела погибших жителей п. Золотое-4 (ФОТО)". Донецк 24 (in Russian). Retrieved 23 October 2018. ^ "В зоне обстрела со стороны ВСУ оказались Горловка, Ясиноватая, Крутая Балка, Жабичево, Спартак, Донецк, Александровка, Лозовое, Старомихайловка - СЦКК". 19 October 2018. Retrieved 20 October 2018. ^ "Украинский террор: в ДНР сообщают о массированных обстрелах". News Front - Новостной Фронт. Новости Мира России Украины (in Russian). Retrieved 27 October 2018. ^ 24, Донецк. "Оперативная сводка за сутки с 16 на 17 октября от НМ ЛНР". Донецк 24 (in Russian). Retrieved 20 October 2018. ^ "Операція об'єднаних сил / Joint forces operation | Зведення станом на 18:00 19 жовтня 2018 року" (in Ukrainian). Press-centre of the JFO HQ. 19 October 2018. Retrieved 19 October 2018. ^ a b "Зведення щодо обстановки в районі проведення операції Об'єднаних сил станом на 07:00 20 жовтня 2018 року" (in Ukrainian). MoD. 20 October 2018. Retrieved 20 October 2018. ^ "One soldier injured amid 16 attacks on Ukrainian positions in Donbas over past day". Ukrinform. 20 October 2018. Retrieved 20 October 2018. ^ "ВСУ применяли против Республики минометы и бронетехнику - СЦКК". 20 October 2018. Retrieved 20 October 2018. ^ 24, Донецк. "Оперативная сводка за сутки с 19 на 20 октября от НМ ЛНР". Донецк 24 (in Russian). Retrieved 21 October 2018. ^ "Зведення щодо обстановки у районі проведення операції Об'єднаних сил станом на 18:00 20 жовтня 2018 року" (in Ukrainian). MoD. 20 October 2018. Retrieved 20 October 2018. ^ a b "Зведення щодо обстановки в районі проведення операції Об'єднаних сил станом на 07:00 21 жовтня 2018 року" (in Ukrainian). MoD. 21 October 2018. Retrieved 21 October 2018. ^ "Брифінг речника Міністерства оборони України щодо обстановки в районі проведення операції Об'єднаних сил" (in Ukrainian). MoD. 21 October 2018. Retrieved 21 October 2018. ^ "В зоне обстрела со стороны ВСУ оказались Горловка, Донецк, Ясиноватая, Спартак, Васильевка, Александровка, Луганское, Докучаевск, Ленинское, Саханка - СЦКК". 21 October 2018. Retrieved 21 October 2018. ^ 24, Донецк. "Оперативная сводка за сутки с 20 на 21 октября от НМ ЛНР". Донецк 24 (in Russian). Retrieved 21 October 2018. ^ "Операція об'єднаних сил / Joint forces operation | Зведення станом на 18:00 21 жовтня 2018 року" (in Ukrainian). Press-centre of the JFO HQ. 21 October 2018. Retrieved 21 October 2018. ^ a b "Зведення щодо обстановки в районі проведення операції Об'єднаних сил станом на 07:00 22 жовтня 2018 року" (in Ukrainian). MoD. 22 October 2018. Retrieved 22 October 2018. ^ "Militants launched 19 attacks on Ukrainian troops in Donbas in last day". Ukrinform. 22 October 2018. Retrieved 22 October 2018. ^ a b c d "Брифінг речника Міністерства оборони України щодо обстановки в районі проведення операції Об'єднаних сил" (in Ukrainian). MoD. 22 October 2018. Retrieved 22 October 2018. ^ "Зафиксировано тридцать нарушений режима прекращения огня со стороны ВСУ - СЦКК". 22 October 2018. Retrieved 22 October 2018. ^ "Под огнем украинских силовиков за сутки погибли четверо военнослужащих НМ ДНР | ДАН". dan-news.info (in Russian). Retrieved 27 October 2018. ^ 24, Донецк. "Оперативная сводка за сутки с 21 на 22 октября от НМ ЛНР". Донецк 24 (in Russian). Retrieved 22 October 2018. ^ "Операція об'єднаних сил / Joint forces operation | Зведення станом на 18:00 22 жовтня 2018 року" (in Ukrainian). Press-centre of the JFO HQ. 22 October 2018. Retrieved 22 October 2018. ^ a b "Зведення щодо обстановки в районі проведення операції Об'єднаних сил станом на 07:00 23 жовтня 2018 року" (in Ukrainian). MoD. 23 October 2018. Retrieved 23 October 2018. ^ "Militants launched 12 attacks on Ukrainian troops in Donbas in last day". Ukrinform. 23 October 2018. Retrieved 23 October 2018. ^ a b c d "Брифінг речника Міністерства оборони України щодо обстановки в районі проведення операції Об'єднаних сил" (in Ukrainian). MoD. 23 October 2018. Retrieved 23 October 2018. ^ "Зафиксировано двадцать два нарушения режима прекращения огня со стороны ВСУ - СЦКК / Twenty-two cease-fire violations by the AFU were recorded — JCCC". 23 October 2018. Retrieved 23 October 2018. ^ 24, Донецк. "Оперативная сводка за сутки с 22 на 23 октября от НМ ЛНР". Донецк 24 (in Russian). Retrieved 23 October 2018. ^ "Операція об'єднаних сил / Joint forces operation | Зведення станом на 18:00 23 жовтня 2018 року" (in Ukrainian). Press-centre of the JFO HQ. 23 October 2018. Retrieved 23 October 2018. ^ a b "Зведення щодо обстановки в районі проведення операції Об'єднаних сил станом на 07:00 22 жовтня 2018 року" (in Ukrainian). MoD. 24 October 2018. Retrieved 24 October 2018. ^ "Militants launched nine attacks on Ukrainian troops in Donbas in last day". Ukrinform. 24 October 2018. Retrieved 24 October 2018. ^ "За сутки ВСУ выпустили по территории Республики более 140 боеприпасов - СЦКК". 24 October 2018. Retrieved 24 October 2018. ^ 24, Донецк. "Оперативная сводка за сутки с 23 на 24 октября от НМ ЛНР". Донецк 24 (in Russian). Retrieved 24 October 2018. ^ "Операція об'єднаних сил / Joint forces operation | Зведення станом на 18:00 24 жовтня 2018 року" (in Ukrainian). Press-centre of the JFO HQ. 24 October 2018. Retrieved 24 October 2018. ^ a b "Зведення щодо обстановки в районі проведення операції Об'єднаних сил станом на 07:00 24 жовтня 2018 року" (in Ukrainian). MoD. 25 October 2018. Retrieved 25 October 2018. ^ "Militants launched 14 attacks on Ukrainian troops in Donbas in last day". Ukrinform. 25 October 2018. Retrieved 25 October 2018. ^ 24, Донецк. "Зафиксирован обстрел со стороны ВСУ по Доломитному". Донецк 24 (in Russian). Retrieved 25 October 2018. ^ 24, Донецк. "Зафиксированы обстрелы со стороны ВСУ по Старомихайловке и Широкой Балке". Донецк 24 (in Russian). Retrieved 25 October 2018. ^ "ВСУ применили по территории Республики более трехсот единиц боеприпасов, повреждены жилые дома - СЦКК". 25 October 2018. Retrieved 25 October 2018. ^ 24, Донецк. "Оперативная сводка за сутки с 24 на 25 октября от НМ ЛНР". Донецк 24 (in Russian). Retrieved 26 October 2018. ^ "Зведення щодо обстановки у районі проведення операції Об'єднаних сил станом на 18:00 25 жовтня 2018 року" (in Ukrainian). MoD. 25 October 2018. Retrieved 25 October 2018. ^ a b "Зведення щодо обстановки в районі проведення операції Об'єднаних сил станом на 07:00 26 жовтня 2018 року" (in Ukrainian). MoD. 26 October 2018. Retrieved 26 October 2018. ^ "Militants launched 17 attacks on Ukrainian troops in Donbas in last day". Ukrinform. 26 October 2018. Retrieved 26 October 2018. ^ 24, Донецк. "Зафиксированы обстрелы со стороны ВСУ по Горловке, Донецку, Саханке, Спартаку и Крутой Балке". Донецк 24 (in Russian). Retrieved 26 October 2018. ^ 24, Донецк. "Зафиксирован обстрел со стороны ВСУ по Коминтерново". Донецк 24 (in Russian). Retrieved 26 October 2018. ^ "ВСУ девятнадцать раз нарушили режим прекращения огня - СЦКК". 26 October 2018. Retrieved 26 October 2018. ^ "Киевские боевики совершили порядка 160 обстрелов территорий ДНР". News Front - Новостной Фронт. Новости Мира России Украины (in Russian). Retrieved 27 October 2018. ^ 24, Донецк. "Оперативная сводка за сутки с 25 на 26 октября от НМ ЛНР". Донецк 24 (in Russian). Retrieved 27 October 2018. ^ "Зведення щодо обстановки у районі проведення операції Об'єднаних сил станом на 18:00 23 жовтня 2018 року" (in Ukrainian). MoD. 26 October 2018. Retrieved 26 October 2018. ^ a b "Зведення щодо обстановки в районі проведення операції Об'єднаних сил станом на 07:00 24 жовтня 2018 року" (in Ukrainian). MoD. 27 October 2018. Retrieved 27 October 2018. ^ "Militants launched eight attacks on Ukrainian troops in Donbas in last day". Ukrinform. 27 October 2018. Retrieved 27 October 2018. ^ 24, Донецк. "Зафиксированы обстрелы со стороны ВСУ по Старомихайловке и Спартаку". Донецк 24 (in Russian). Retrieved 27 October 2018. ^ "Germany, France blame Moscow for downing of OSCE drone over eastern Ukraine". Reuters. 1 November 2018. Retrieved 4 November 2018. ^ "OSCE Mission's Drone Shot Down After Spotting Russian Missile System In Eastern Ukraine". RFE/RL. 1 November 2018. Retrieved 1 November 2018. ^ "За сутки ВСУ выпустили по территории Республики около 400 боеприпасов - СЦКК". 27 October 2018. Retrieved 27 October 2018. ^ 24, Донецк. "Оперативная сводка за сутки с 26 на 27 октября от НМ ЛНР". Донецк 24 (in Russian). Retrieved 28 October 2018. ^ "Зведення щодо обстановки у районі проведення операції Об'єднаних сил станом на 18:00 27 жовтня 2018 року" (in Ukrainian). MoD. 27 October 2018. Retrieved 27 October 2018. ^ a b "Зведення щодо обстановки в районі проведення операції Об'єднаних сил станом на 07:00 28 жовтня 2018 року" (in Ukrainian). MoD. 28 October 2018. Retrieved 28 October 2018. ^ "ВСУ снова попытались ударить с воздуха по ДНР". News Front - Новостной Фронт. Новости Мира России Украины (in Russian). Retrieved 30 October 2018. ^ "За сутки ВСУ выпустили по территории Республики около 400 боеприпасов - СЦКК". 28 October 2018. Retrieved 28 October 2018. ^ 24, Донецк. "Оперативная сводка за сутки с 27 на 28 октября от НМ ЛНР". Донецк 24 (in Russian). Retrieved 28 October 2018. ^ "Зведення щодо обстановки в районі проведення операції Об'єднаних сил станом на 18:00 28 жовтня 2018 року" (in Ukrainian). MoD. 28 October 2018. Retrieved 28 October 2018. ^ a b "Зведення щодо обстановки в районі проведення операції Об'єднаних сил станом на 07:00 29 жовтня 2018 року" (in Ukrainian). MoD. 29 October 2018. Retrieved 29 October 2018. ^ "Militants launched 19 attacks on Ukrainian troops in Donbas in last day". Ukrinform. 29 October 2018. Retrieved 29 October 2018. ^ "В зоне обстрела со стороны ВСУ оказались Горловка, Зайцево, Донецк, Спартак, Крутая Балка, Старомихайловка, Александровка, Еленовка, Ленинское, Саханка, Коминтерново - СЦКК". 29 October 2018. Retrieved 29 October 2018. ^ 24, Донецк. "Оперативная сводка за сутки с 28 на 29 октября от НМ ЛНР". Донецк 24 (in Russian). Retrieved 29 October 2018. ^ "Операція об'єднаних сил / Joint forces operation | Зведення станом на 18:00 29 жовтня 2018 року" (in Ukrainian). Press-centre of the JFO HQ. 29 October 2018. Retrieved 29 October 2018. ^ a b "Зведення щодо обстановки в районі проведення операції Об'єднаних сил станом на 07:00 30 жовтня 2018 року" (in Ukrainian). MoD. 30 October 2018. Retrieved 30 October 2018. ^ "Militants launched 20 attacks on Ukrainian troops in Donbas in last day". Ukrinform. 30 October 2018. Retrieved 30 October 2018. ^ "ВСУ обстреляли 13 населенных пунктов - СЦКК". 30 October 2018. Retrieved 30 October 2018. ^ 24, Донецк. "Оперативная сводка за сутки с 29 на 30 октября от НМ ЛНР". Донецк 24 (in Russian). Retrieved 30 October 2018. ^ "Операція об'єднаних сил / Joint forces operation | Зведення станом на 18:00 30 жовтня 2018 року" (in Ukrainian). Press-centre of the JFO HQ. 30 October 2018. Retrieved 30 October 2018. ^ a b "Зведення щодо обстановки в районі проведення операції Об'єднаних сил станом на 07:00 31 жовтня 2018 року" (in Ukrainian). MoD. 31 October 2018. Retrieved 31 October 2018. ^ "Militants launched 21 attacks on Ukrainian troops in Donbas in last day". Ukrinform. 31 October 2018. Retrieved 31 October 2018. ^ "ВСУ применяют против городов и поселков ДНР минометы и вооружение бронетехники - СЦКК". 31 October 2018. Retrieved 31 October 2018. ^ 24, Донецк. "Оперативная сводка за сутки с 30 на 31 октября от НМ ЛНР". Донецк 24 (in Russian). Retrieved 31 October 2018. ^ "Зведення щодо обстановки у районі проведення операції Об'єднаних сил станом на 18:00 31 жовтня 2018 року" (in Ukrainian). MoD. 31 October 2018. Retrieved 31 October 2018. ^ "Militants launched 24 attacks on Ukrainian troops in Donbas in last day". Ukrinform. 1 November 2018. Retrieved 1 November 2018.